Avengers 170 was cover dated April 1978 and was on sale in January 1978, sharing the spinner racks with Action Comics #482, Devil Dinosaur #1, Firestorm #2, Godzilla #9, Justice League of America #153 and Machine Man #1. Though Hell should bar the way was written by Jim Shooter and drawn by George Perez. Although this is considered part of the Korvac saga and is included in the Korvac Saga TPB, Korvac doesn’t actually appear in this issue. The Guardians of the Galaxy do however, if only briefly. 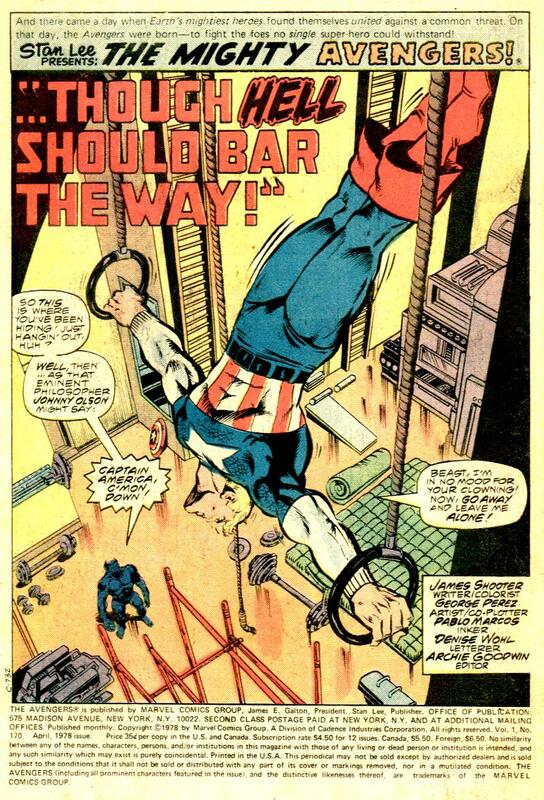 The issue opens with Captain America exercising to maintain his level of fitness, pausing only to have a conversation with the Beast who comments on how Cap and the Scarlet Witch take themselves too seriously, while he does not. 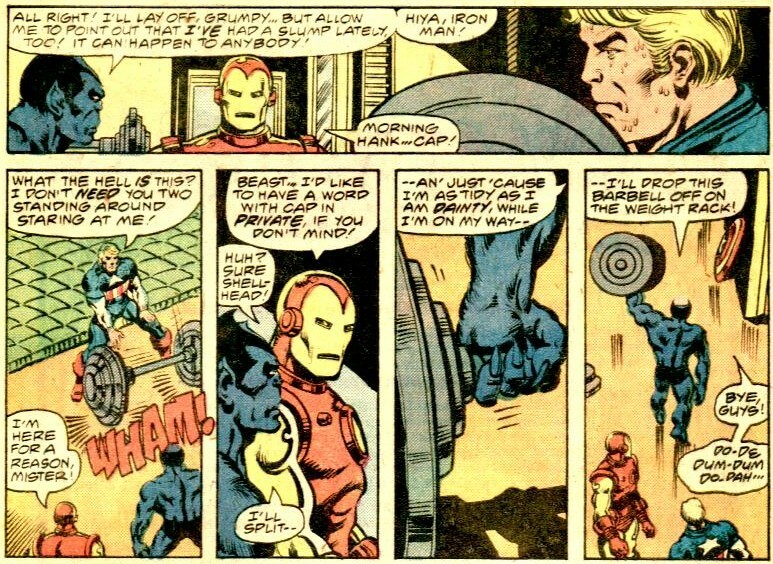 Before Cap can get into full lecture mode, Iron Man walks in and asks to speak to Cap in private. Beast agrees and walks away toting a 500lb bar bell in one hand. 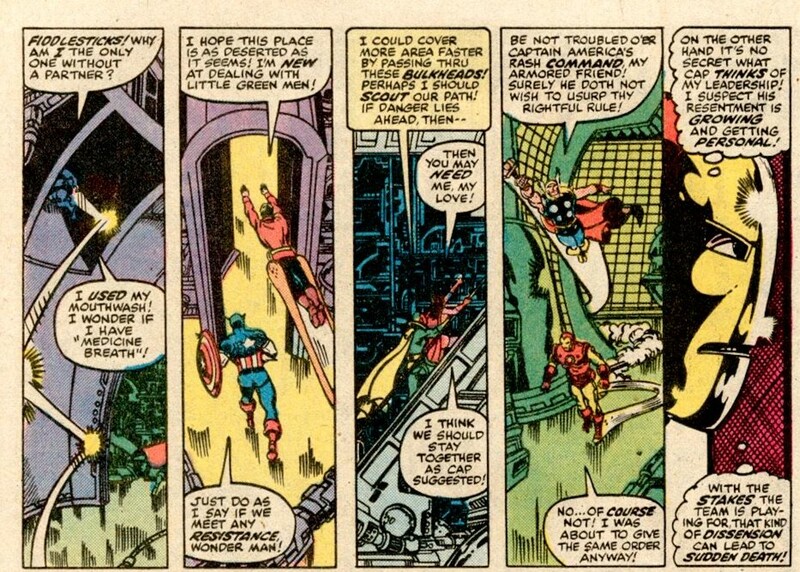 Cap and Iron Man bury the hatchet over recent events, in a scene which at first seem to go anywhere useful. 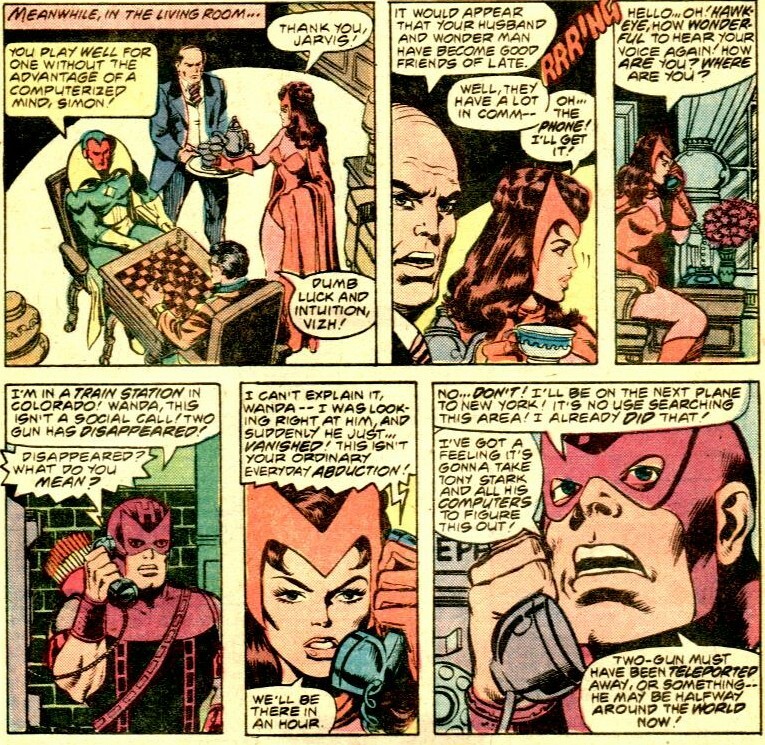 In another part of the mansion, Vision and Wonderman play chess while Scarlet Witch receives a call from Hawkeye about the recent disappearance of Two Gun Kid. 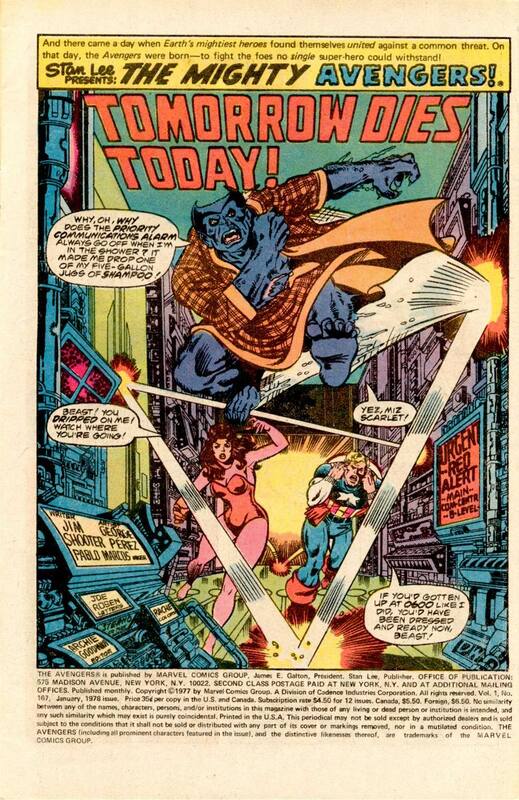 As this call happens former Avenger Quicksilver is in the Inhuman city of Attilan, deep in the Blue area of the Moon. During a conversation with his new wife Crystal, he too vanishes. 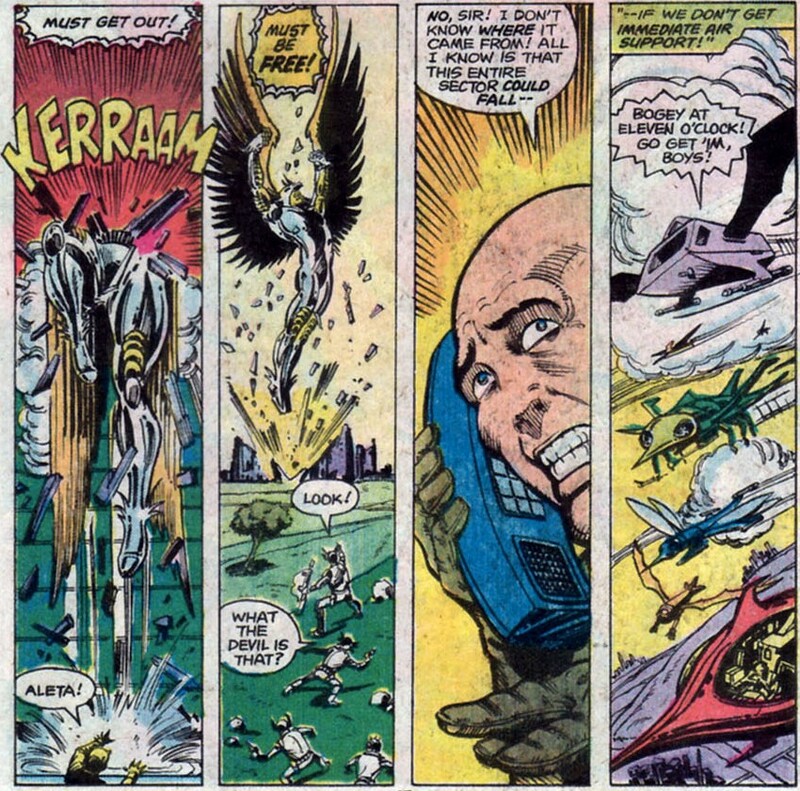 Once Scarlet Witch puts the phone down, Yellow Jacket and the Wasp pop by to deliver Jocasta, the bride of Ultron. 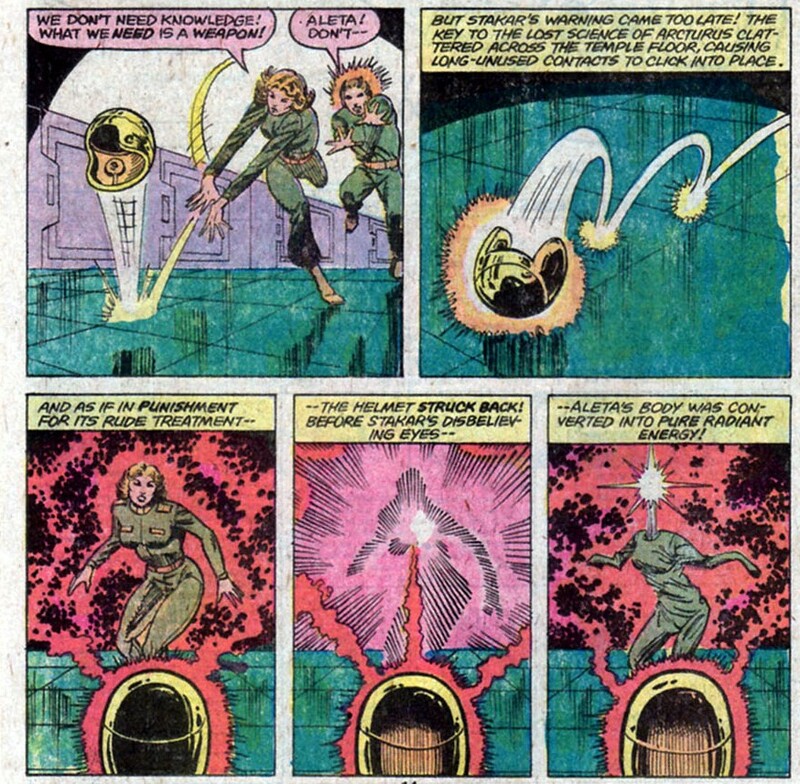 Jocasta has been inert since issue 162, when she sacrificed herself to stop Ultron. Two delivery men bring Jocasta into the mansion for safekeeping, since Wasp won’t let a robot based on her, be kept in her house. In a brief interlude and the reason I’m even looking at this issue, in Saugerties New York, a young Vance Astrovik is playing baseball with some friends and is almost knocked over by a truck. A large stranger passing by grabs the back of the truck and brings it to a halt. The young Vance tells the distraught driver that he nearly damaged NASA’s future as he is destined to be an astronaut. The large stranger is revealed to be Charlie-27 of the Guardians of the Galaxy. 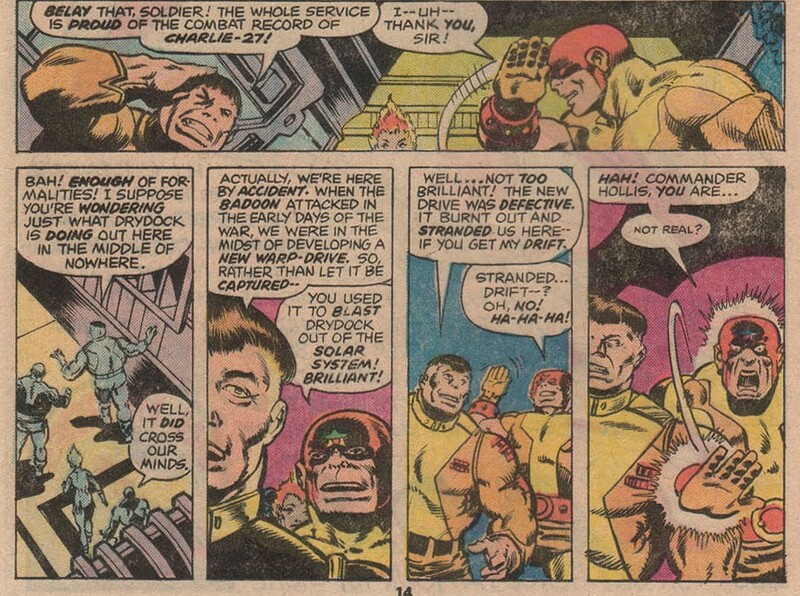 He meets with the rest of the team, where Starhawk decides they are to remain, awaiting Korvac’s attack on young Vance. 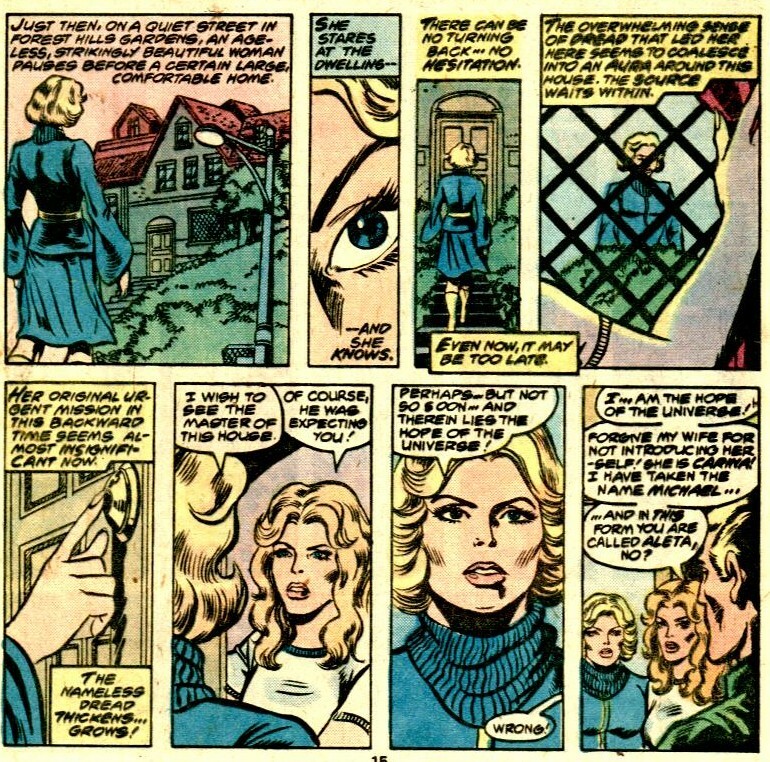 Back at the mansion, the delivery men are surprised as Jocasta awakens and begins to move, she moves to leave the mansion, clearly summoned by Ultron. Encountering the Avengers, Jocasta is confused about how she can be mobile whilst the Wasp still lives, but continues her efforts to escape. 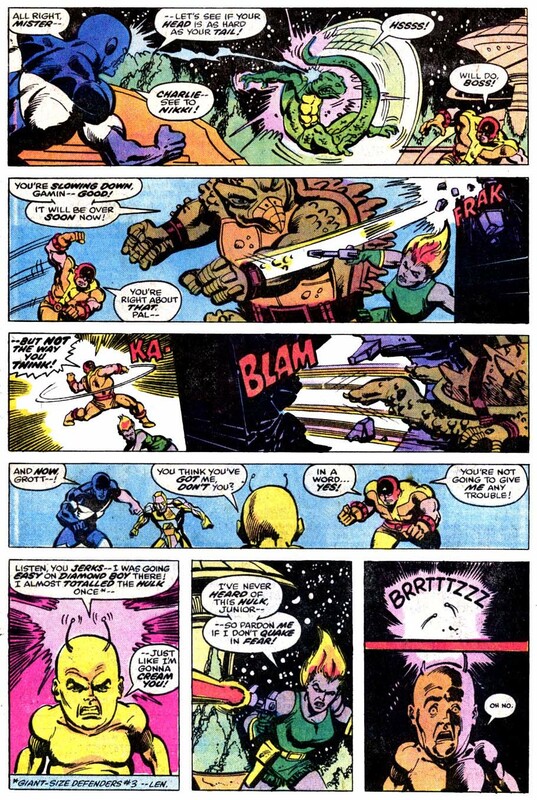 The Vision confronts her and tries his phasing trick, but with the addition of anti-matter pods to her torso, is hurt and collapses to the ground. Unable to move or be touched for over 90 seconds, he requests that everyone else go after her. 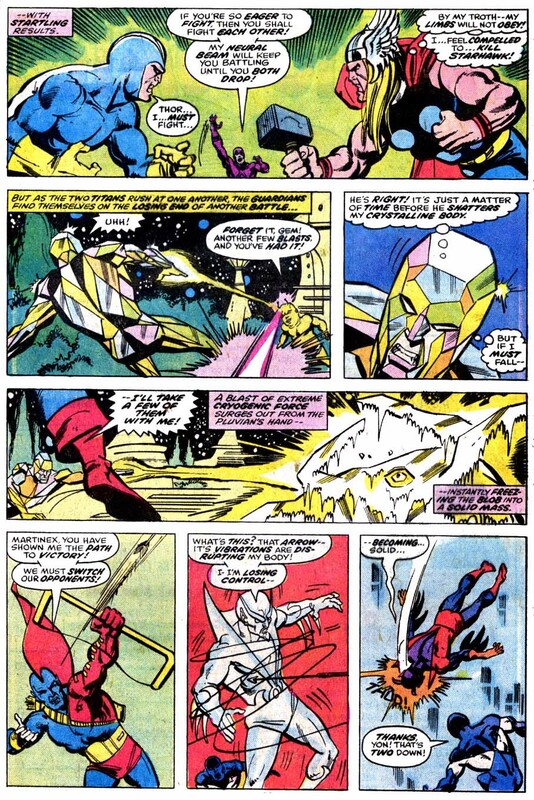 The Wasp and the Beast try to take her out and are quickly beaten and when Yellowjacket, Wonderman and the Scarlet Witch try to stop her, Iron Man intervenes. 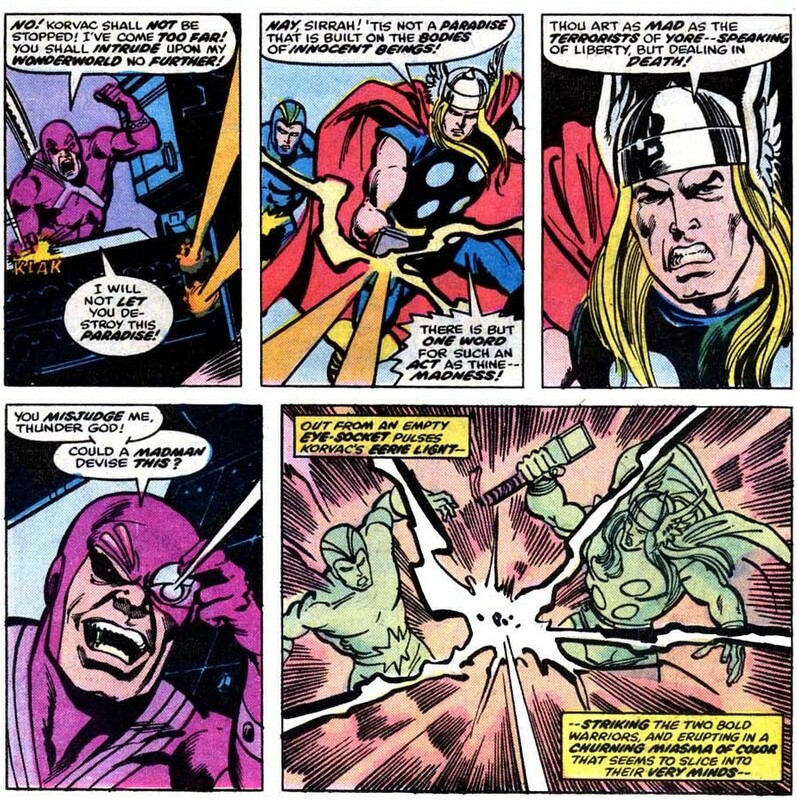 Thor returns, trying also to stop Jocasta, but is stopped by Cap. 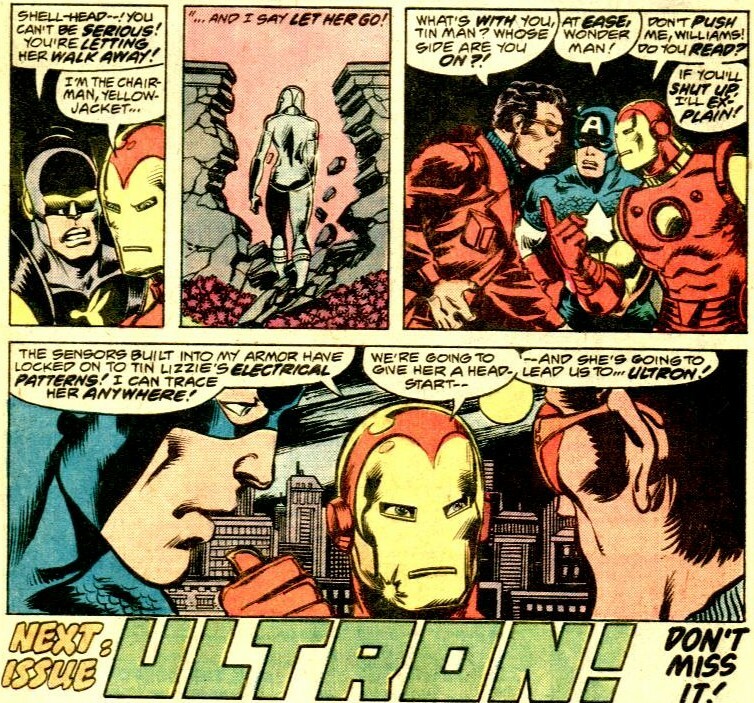 Jocasta walks away whilst everyone starts arguing, until Iron Man points out that Jocasta is trackable and that he and Cap have planned for her escape, so that they can track her to Ultron. Notes: Another solid issue for this run, light on Guardians or Korvac, but so very worthwhile a read in itself. Ultron is one of the great Avengers villains and his weird oedipal thing with Yellowjacket and the Wasp added a great level of complexity and pathos to a simple mad scientist and rogue technology villain that Ultron could have so easily been. Jocasta is a fun character who never got the level of exposure she should have, but that also means she wasn’t overused as so many Avengers characters have been. 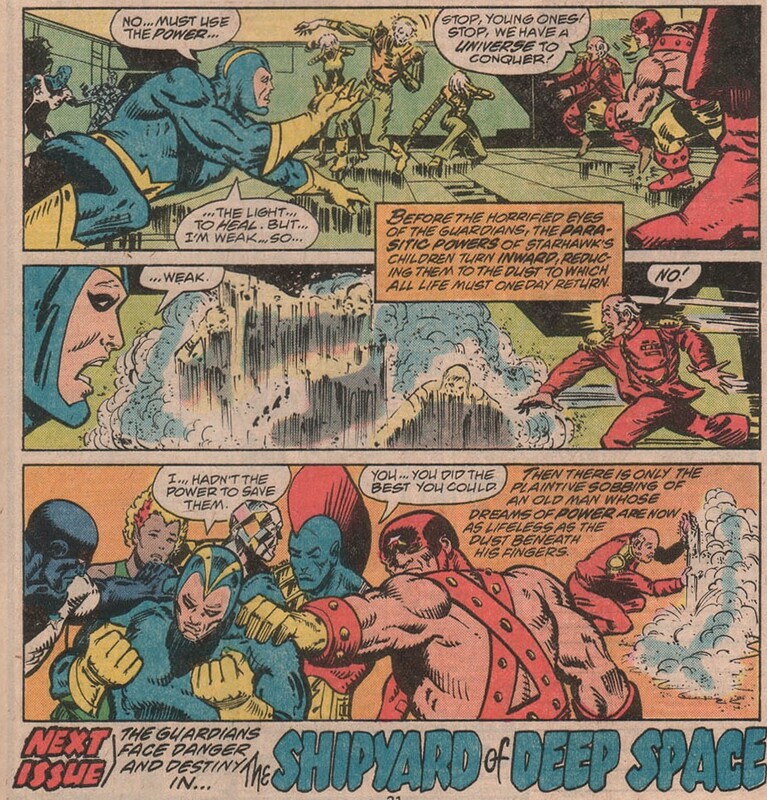 The brief Guardians scene was the only reason I looked at this issue, but it is a great bit of 70’s fun that deserved it’s own entry. 171 had no Korvac or Guardian’s related scenes, so I have skipped it for this blog, but it should be read by anyone who enjoys either the Avengers comic, Earth’s Mightiest Heroes cartoon or Avengers Assemble the movie. The sequel to 2012 epic Avengers film is going to be called Avengers: Age of Ultron, which should give you an idea as to this issue’s importance. 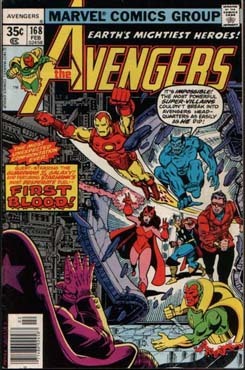 Next is Avengers 172. Avengers 168 was cover dated February 1978 and was on sale November 1977, sharing the spinner racks with Aquaman #60, Fantastic Four #191, Flash #258, Iron Man #107, Justice League of America # 152 and Man From Atlantis #1. First Blood was written by Jim Shooter and drawn by George Perez and picks up right after the last issue with the Avengers and the Guardians of the Galaxy flying to Earth in the quinjet, leaving only Vance Astro on board Drydock. Vance remains to avoid any temporal issues with being in the same time as his younger self. 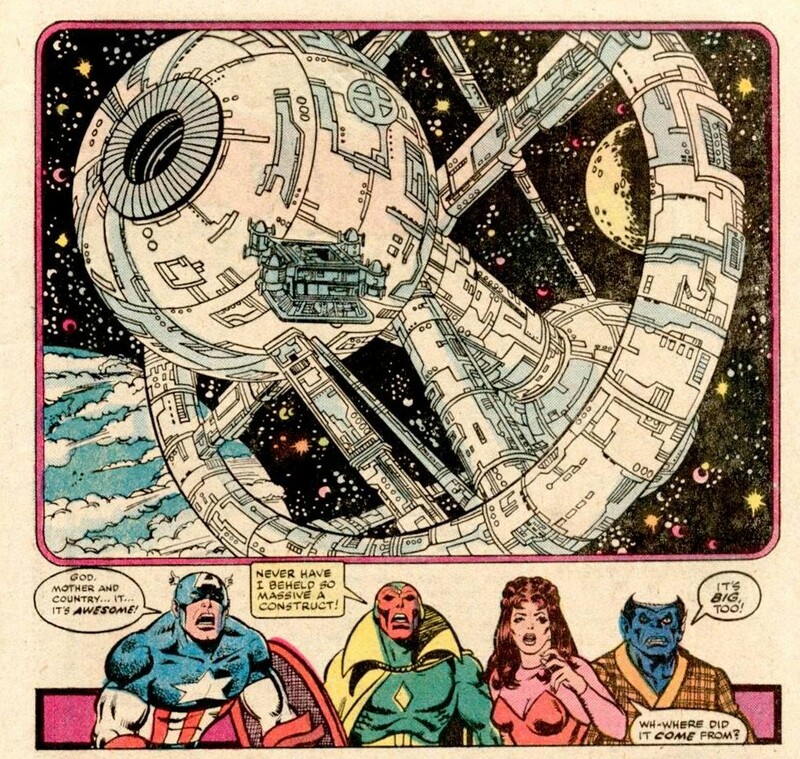 The Quinjet lands at Avengers Mansion, but there is no signal from their receiving station and when the get out of the jet, the alarms are going off and several of the rooms have been ransacked, but nothing seems missing. In the main room, sitting next to a bound and gagged Jarvis is a federal agent Henry Peter Gyrich. 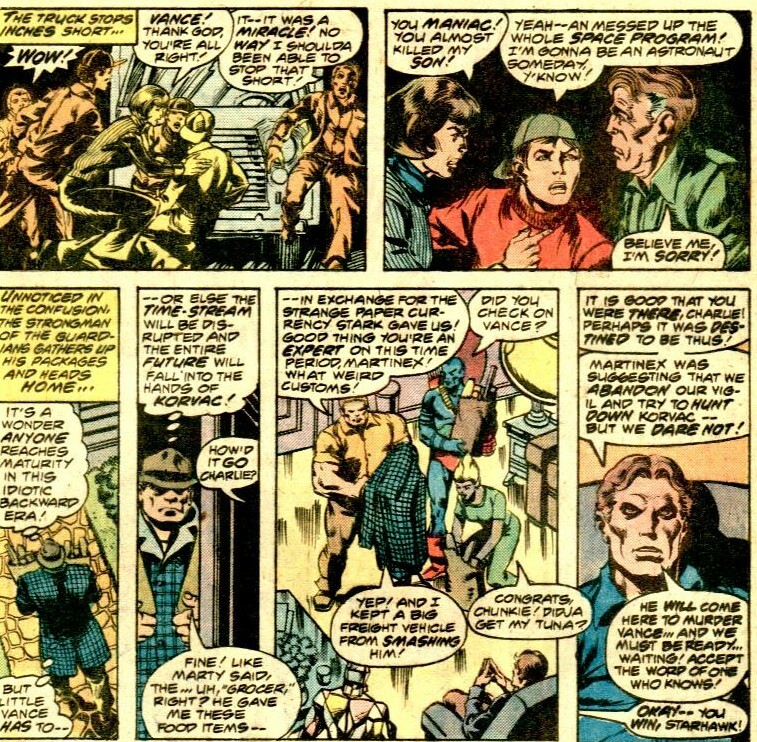 Gyrich, representing the National Security Council berates the team for their lack of security, including a twelve food hole in the wall, cause by Nefaria. Gyrich then threatens to withdraw the teams security clearance and priority status, before departing pointing out that how can the protect national security when their own security is so very lacking. For Captain America, this is the last straw. 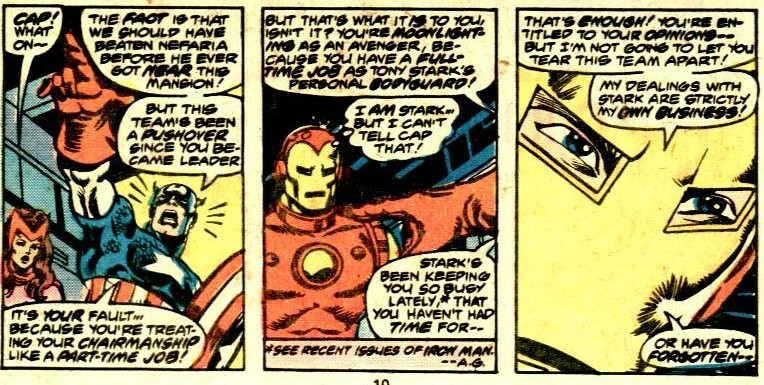 Whilst he is almost always field leader, the current chairman is Iron Man and Cap lays into Iron Man for his part time attendance and the team’srecent lack-lusture performance. 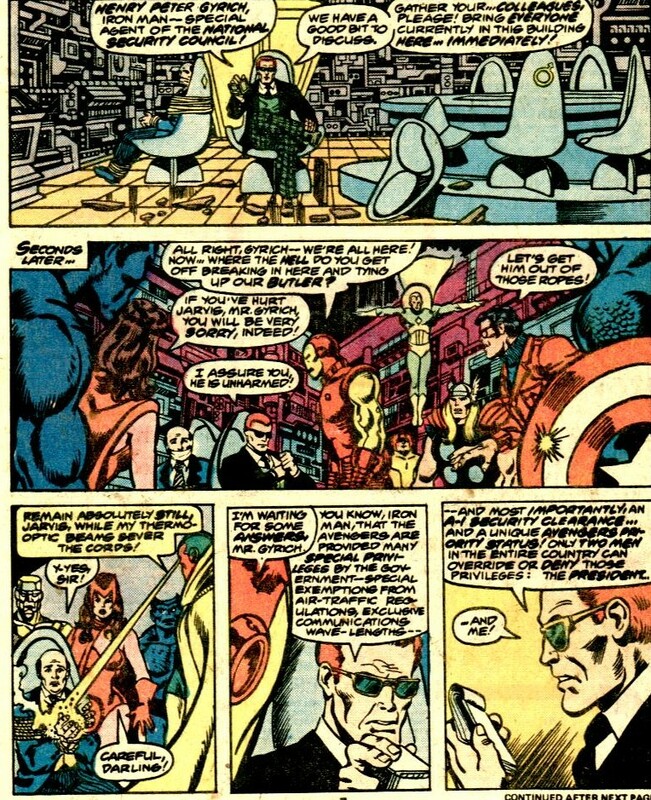 Scarlet Witch puts an end to this argument before it devolves into a full battle, Cap walks away. During this whole thing, the Guardians of the Galaxy are in attendance and it all seems a bit awkward. 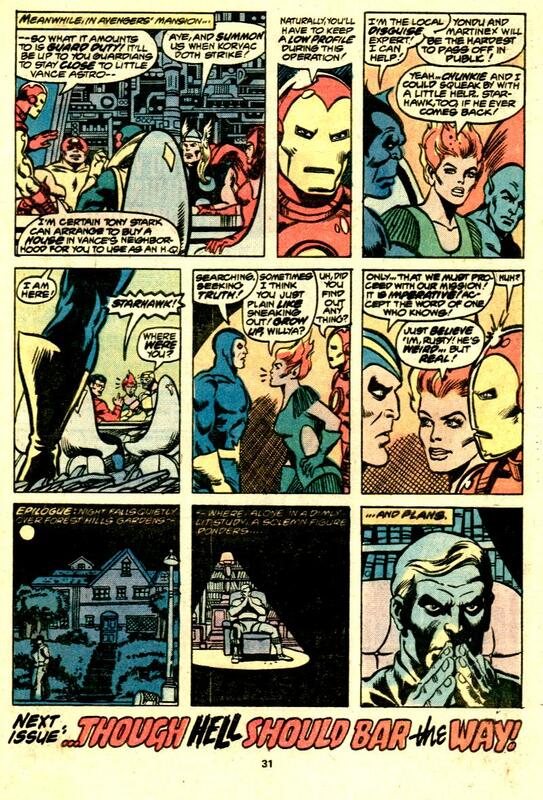 Iron Man tries to bring the conversation back to Korvac and Nikki notices that Starhawk is gone. Starhawk has swapped places with Aleta and has gone to confront Korvac, who is living in Forest Hills, a suburb of Queens in New York. Korvac, now living there under the name Michael along with Carina, the model from issue 167. Aleta and Michael square off and a battle is joined. Aleta and the human looking Michael battle on the physical plane, whilst Starhawk battles a glowing seemingly omnipotent Michael on other dimensional planes. The battle is fierce and many other Marvel characters who are more sensitive to the universe (Dr Strange, Silver Surfer, Spider-Man and Captain Mar-Vell) sense the battle and the danger it poses. Whilst Starhawk battles valiantly, he is no match for the seemingly unlimitedly power of Michael. Michael destroys Starhawk, but sensing that this may cause more problems than it solves, he recreates him. Starhawk no longer remembers finding Michael, nor is he any longer capable of sensing his presence, he the flies off to rejoin the Guardians of the Galaxy. 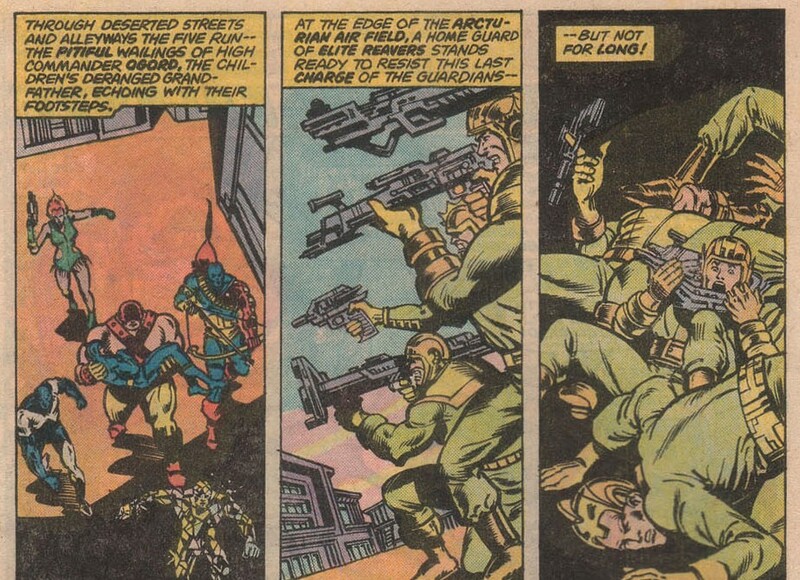 The Avengers and Guardians decide the best course of action is to keep an eye on the 20th version of Vance and wait for Korvac to make his move, whilst in Queens Michael simply sits and plans. Notes: This is a very busy issue, as well as all that happens here, there is a subplot with Hawkeye and the Two Gun Kid travelling across America and the Kid vanishes. This is part of a very serialized time in Marvel’s history with several plots running at once and it all feeling like a long continuing story and not a collection of two parters and single issues. The Avengers have had several high points in their publication history and I have often thought that this is slap-bang in the middle of one of their high points. 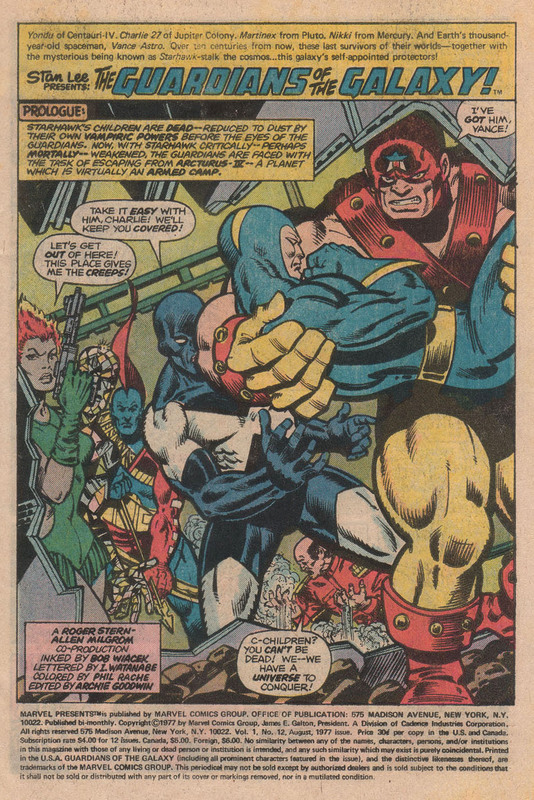 The next Avengers issue is a clear fill-in, with no appearances by Korvac or the Guardians of the Galaxy, so I’m going to look at issue 170 next. Avengers 167 was cover dated January 1978 and was on sale in October 1977, sharing the spinner racks with All-Star Comics #70, Amazing Spider-Man #1976, Black Lightning 6, Captain Marvel #54, Green Lantern #100 and Marvel Team-Up 65. 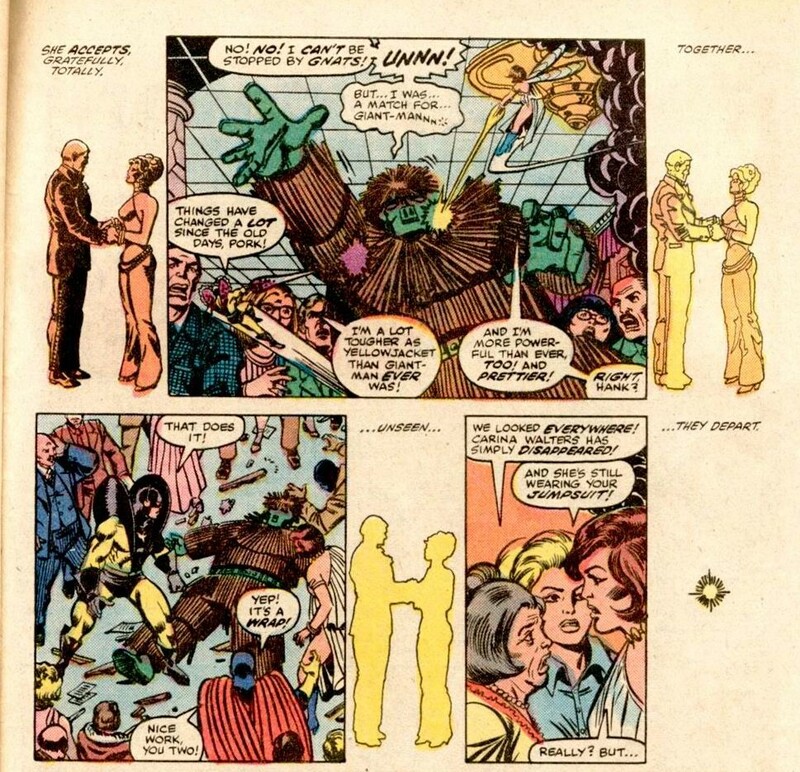 The Tomorrow Dies Today was written by Jim Shooter and drawn by the legendary George Perez. 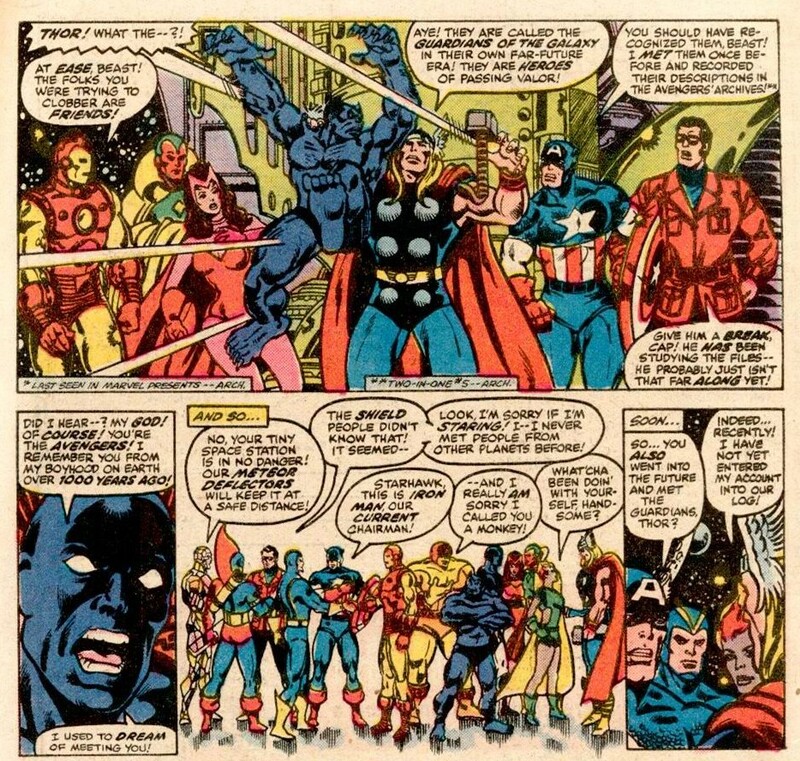 The roll call of the team at this point was Captain America serving as team leader, Iron Man, Thor, Vision, Scarlet Witch, Wonderman and the Beast. 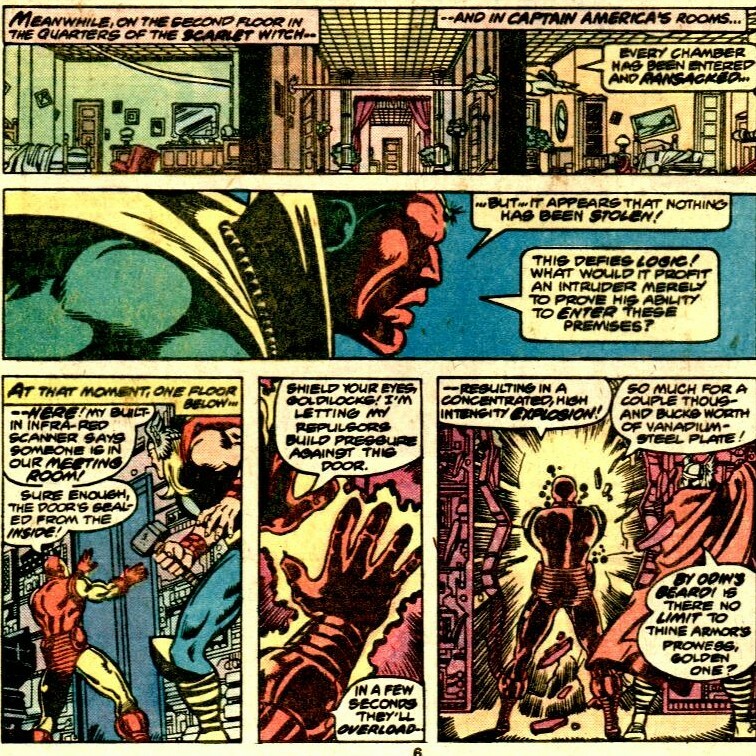 An alarm blazes through the walls of Avengers mansion, summoning Scarlet Witch, Captain America and Beast, who at this point was still in the shower, they race to the main room with some additional bickering and find Vision, already at the monitor, putting through a video call from Nick Fury, director of S.H.I.E.L.D. 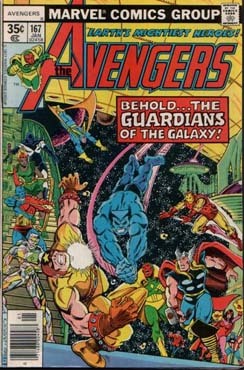 Fury tells them that there is a large, unknown space ship orbiting Earth, posing a risk to S.H.I.E.L.D.’s space station. Captain America agrees to help and the team race to be ready. On the S.H.I.E.L.D. station Tony Stark (secretly Iron Man) asks to be evacuated so he can join the team before they leave. Cap also summons Thor and Wonderman who are in a nearby diner going over their recent experiences and further the subplot of Wonderman’s feelings of inadequacy. 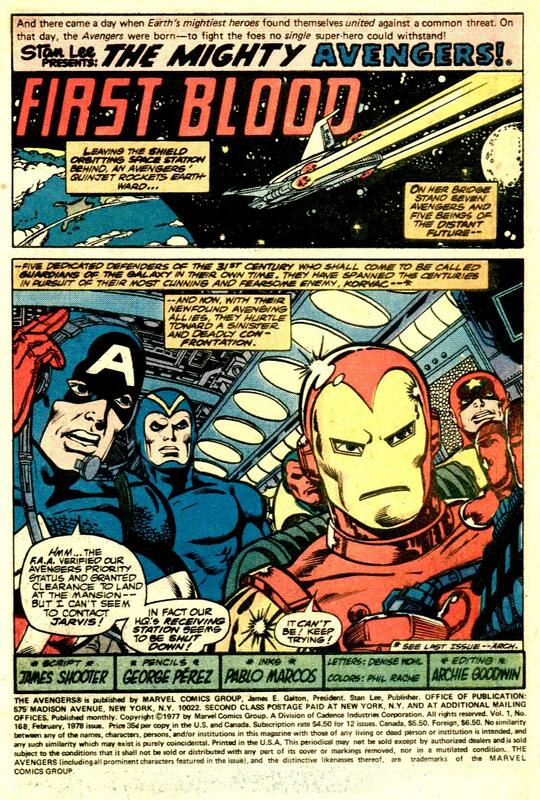 The Avengers’ Quinjet docks with S.H.I.E.L.D’s station and the team with the exception of Thor, Iron Man and the Vision are outfitted with Spacesuits. Wonderman is unlikely to need one, but takes one to be safe. The team are pointed to an opening and jump from station to ship. The opening, an airlock, opens fully to let them in and then shuts behind them. The air is breathable and perfectly suited for human life so the team divests itself of the spacesuits. 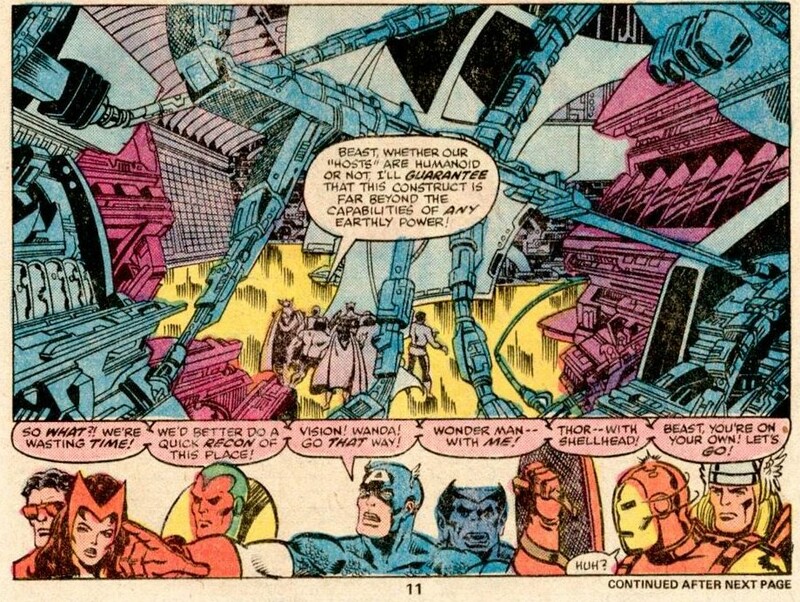 The Avengers are awestruck by the size of the ship and Captain America orders the team to split into recon teams. 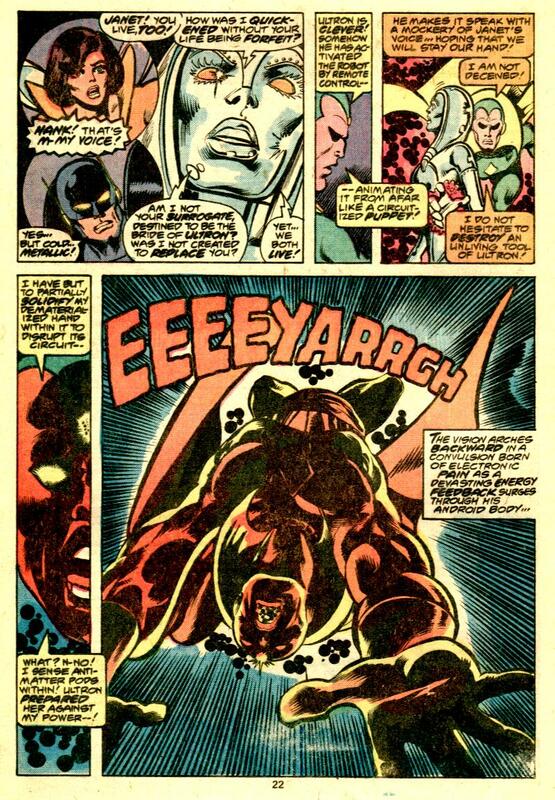 Vision and the Scarlet Witch go one way, Cap and Wonderman another, Thor and Iron Man another and Beast scouts ahead on his own, to which there is his usual complaining banter. As he scouts, he is grabbed by a hand, eleven times more dense than one he’d be used to. He is pulled up and we are re-introduced to Charlie-27 and Nikki of the Guardians of the Galaxy. Although the Guardians have been to this time before, they haven’t encountered any 20th century beings whilst aboard the Drydock. 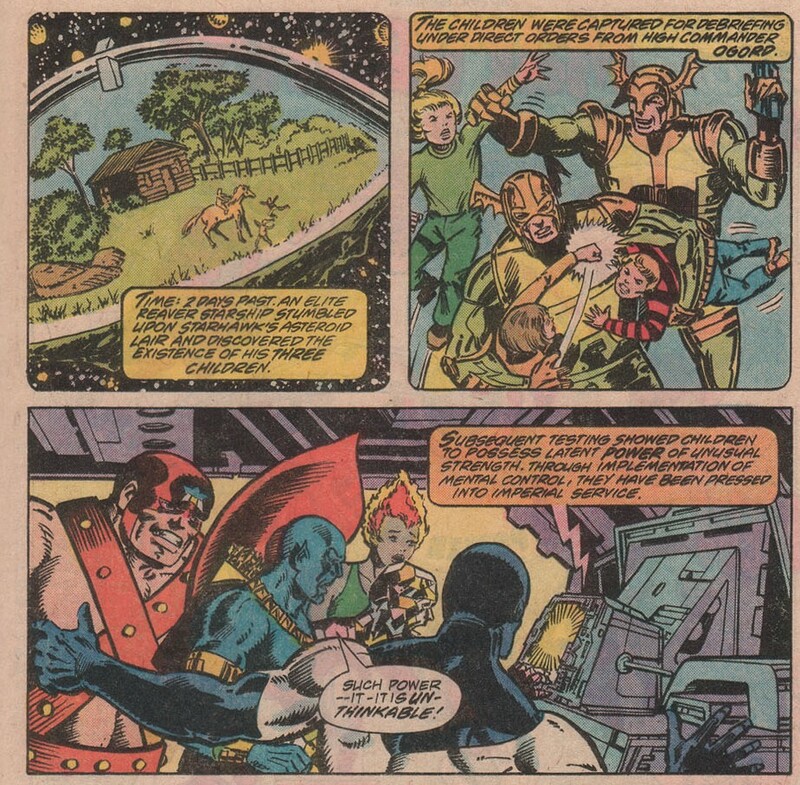 Charlie-27 believes Beast to be some kind of space monkey and there is a brief scuffle, which is ended by the arrival of Starhawk, Vance Astro, Yondu and Martinex, the remainder of the Guardians. 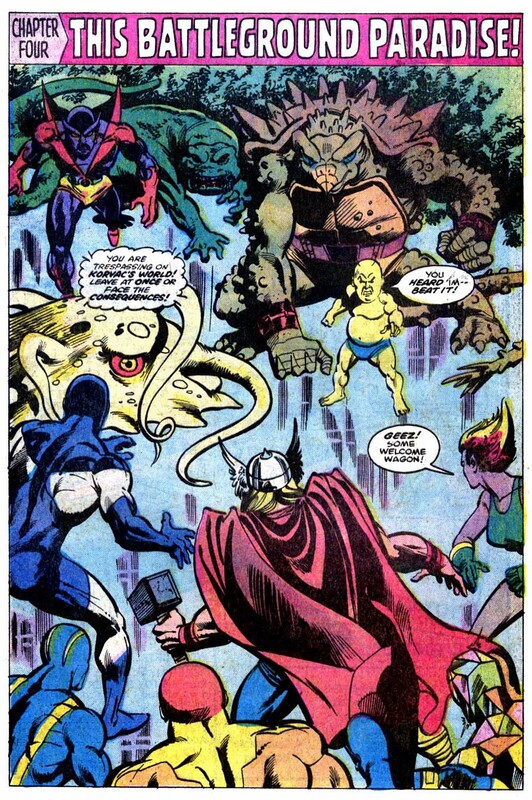 There is a little meet and greet between the two teams, with Thor revealing that he had recently met the Guardians in their future defeating Korvac. The Guardians reveal that Korvac has returned to the past to kill one of the Guardians, Vance Astro, when he was a boy in the 20th Century. The scene then shifts to a fashion show. 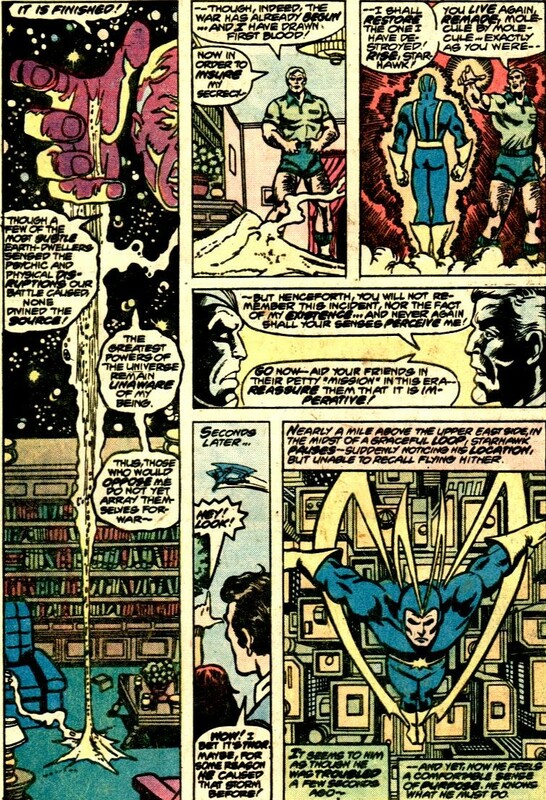 Organised by Janet Van Dyne also known as the Wasp with her husband Hank Pym also known as Yellowjacket in attendance. In the crowd we find Kyle ‘Nightwing’ Richmond in the audience as well as a tuxedo clad stranger who simply stares at the models. He doesn’t respond until one of the models Carina Walters walks on and then he seems entranced by her. Before anyone can move or do anything, the show is attacked by the Porcupine. Now to call the Porcupine a B-list villain is to insult Marvel’s stable of B-list villains. He and a handful of masked gunmen demanding money and jewellery. As the Porcupine finds out that robbing a fashion show with two Avengers and a Defender in attendance is not the best idea, the tuxedo wearing man walks over to Carina, there are no words, there doesn’t seem to be a need. They depart, no one sees them leave and the issue ends with a glib compliment from Nighthawk to Wasp on how exciting the show was. Notes: This is one of the all time great line ups, drawn by one of the all time great pencillers and written by Jim Shooter who went on to run Marvel for many of their highest selling years, it had my favourite guest star teams and was the start of a fantastic story arc. Did I like it? Yes, yes I did. The Korvac saga has begun and the awesome is about to begin. 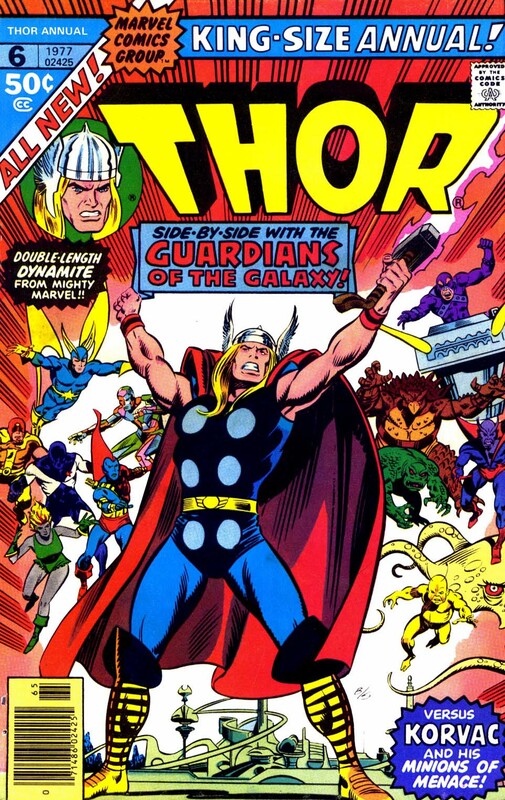 Thor Annual 6 was on sale in July 1977, sharing the spinner racks with Action Comics #476, Eternals Annual #1, Flash #254, John Carter Warlord of Mars Annual #1, Justice League of America #147 and Marvel Special Edition: Star Wars #1. 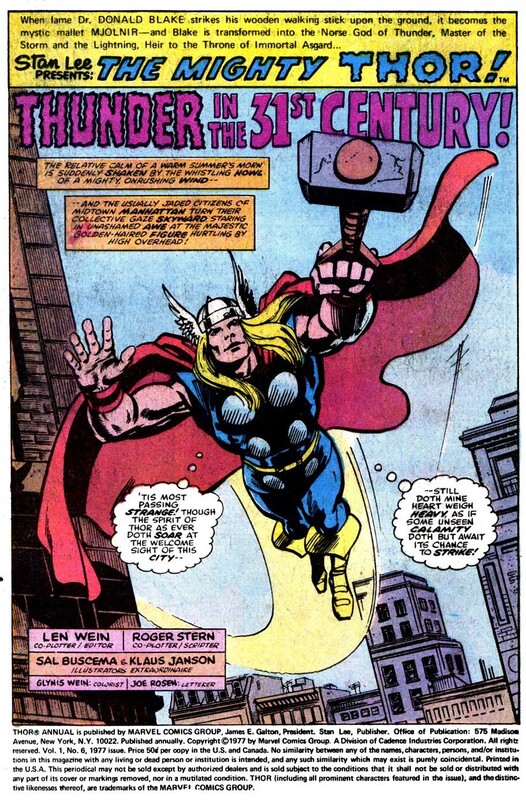 Thunder in the 31st Century was co-written by Len Wein & Roger Stern with art by Sal Buscema & Klaus Janson and opens with Thor flying through the New York sky, enjoying the quiet, but believing that something menacing is about to happen. He notices trouble nearby and is caught up in a situation with terrorists having seized a nuclear reactor. Thor decides to intervene and flies into the building. A brief fight ensues, the terrorists fire wild and the reactor starts to go critical. 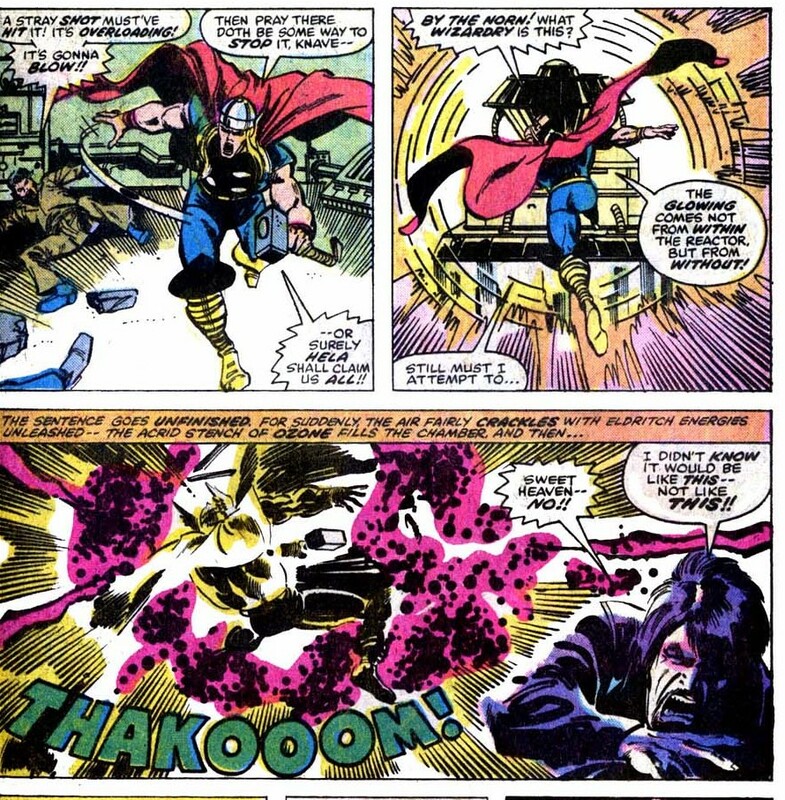 Thor leaps towards it to try and do something and then the reactor and Thor are gone. The Scene then shifts to the bridge of the Freedom’s Lady, the new ship of the Guardians of the Galaxy. Nikki is being instructed on piloting the ship by Charlie-27 and Martinex whilst Yondu adjusts his bow and Vance moons over Nikki. 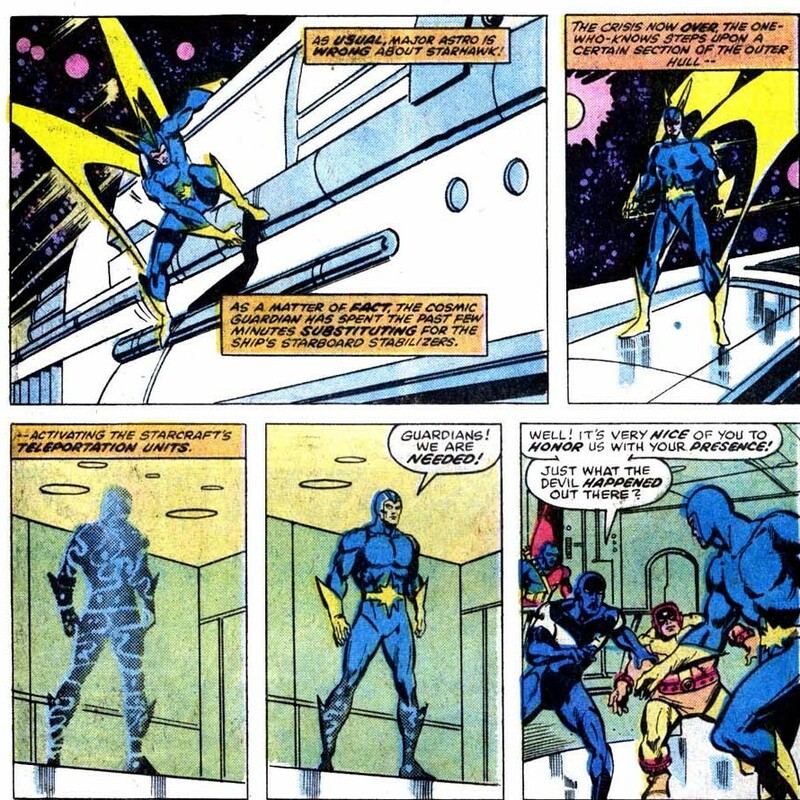 Starhawk, flying outside the ship sees a power beam strike the Freedom’s Lady and on board a component of the ship’s computer relays is damaged and the team works together to keep it in one piece in a scene used to showcase the powers and abilities of each Guardian. 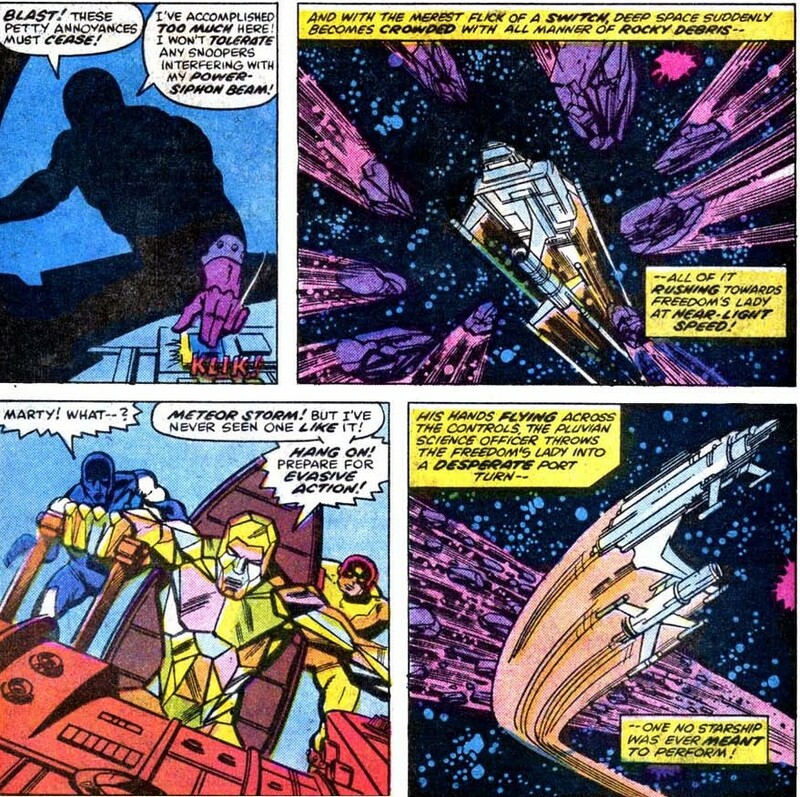 Starhawk returns to the ship to warn the rest of someone playing with powerful forces and as he says that, someone notifies the shadowy figure who dispatched Thor of the ship’s approach and a meteor storm is sent after them. The ship evades the meteors, but is now far off course, leading Starhawk to find a frozen humanoid form adrift in space. 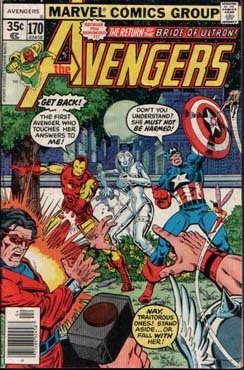 In a scene deliberately made to be reminiscent of Avengers #4, the frozen man awakes surrounded by this team and is revealed to be none of than the mighty Thor. 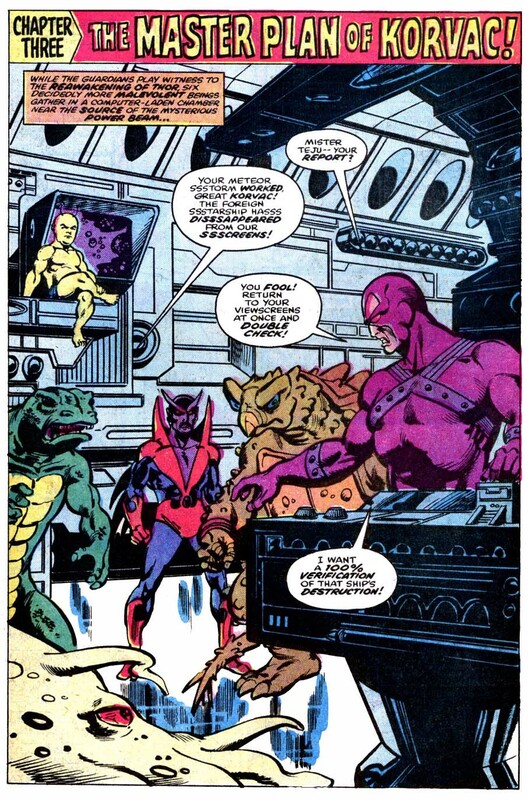 On the nearby planet, a collection of aliens talk about the ship’s apparent destruction, the aliens are revealed to be Grott the Manslayer (a short yellow pyschokinetic with antennae), Mister Teju (a reptilian with a tail), Dumog (an amorphous creature who only speaks telepathically), Brahl (a purple skinned man who can become intangible) Tork ( a sort of anklosaurus looking creature) all of them serve their leader, a purple clad cyborg called Korvac. 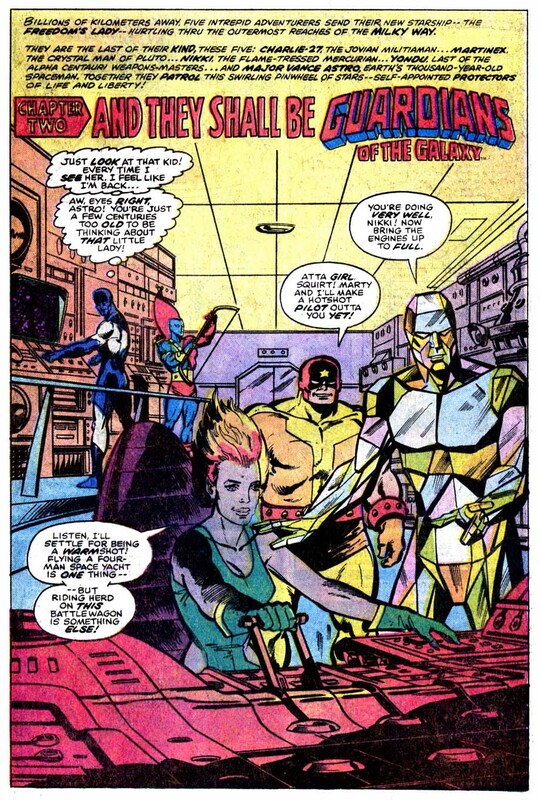 Korvac reveals his origin as a human collaborator during the Badoon invasion, who served as a computer technician who was grafted to computer components for the crime of sleep through exhaustion. 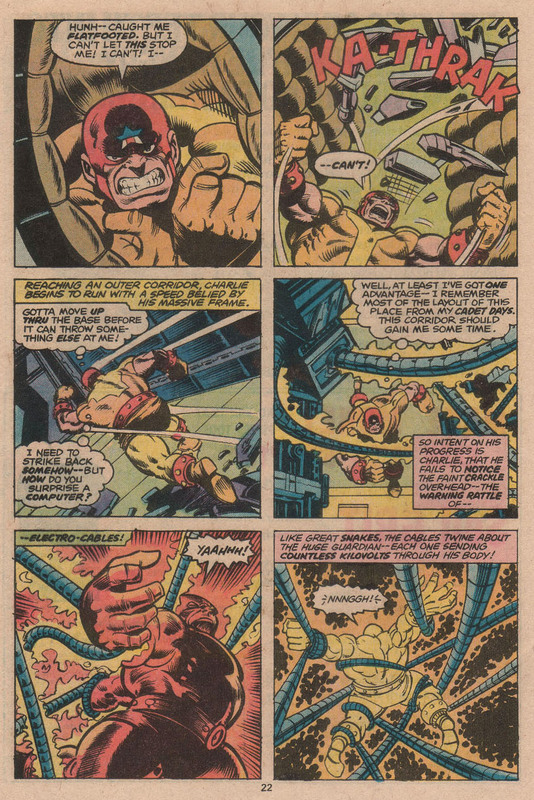 One part of this computer equipment he escaped the Badoon and was briefly caught up in an adventure with the Defenders, once this adventure was done, Korvac stayed on alien world he was brought to in this adventure and using his new computer intelligence and teleportation powers, he began to build his complex. He then sent out time probes for artifacts he wanted and teleportation probes to recruit his team. He seeks to create a paradise for all under his dominion and part of this plan is to power his devices using our sun as a power supply by causing it to go nova with his power beam. 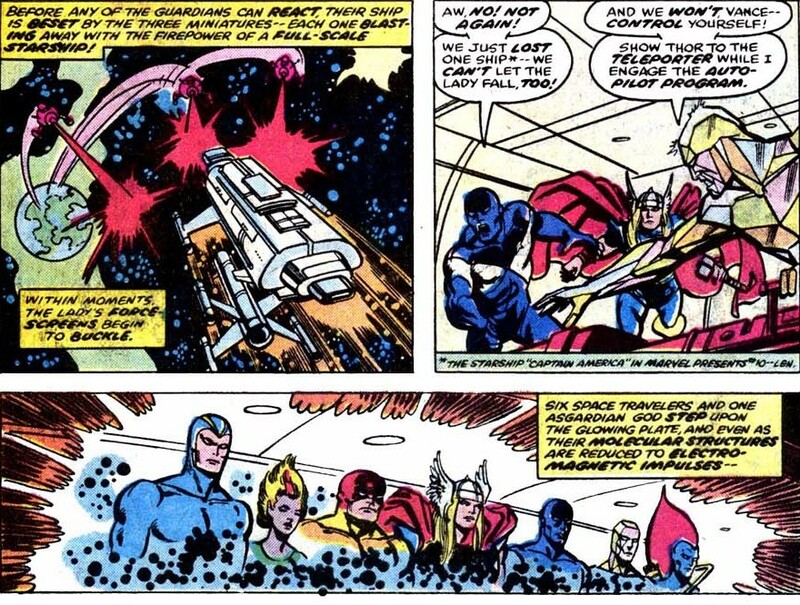 Thor is revived and meets the Guardians and between them all they decide to investigate the power beam and the villain responsible to both the beam and leaving Thor adrift in space. 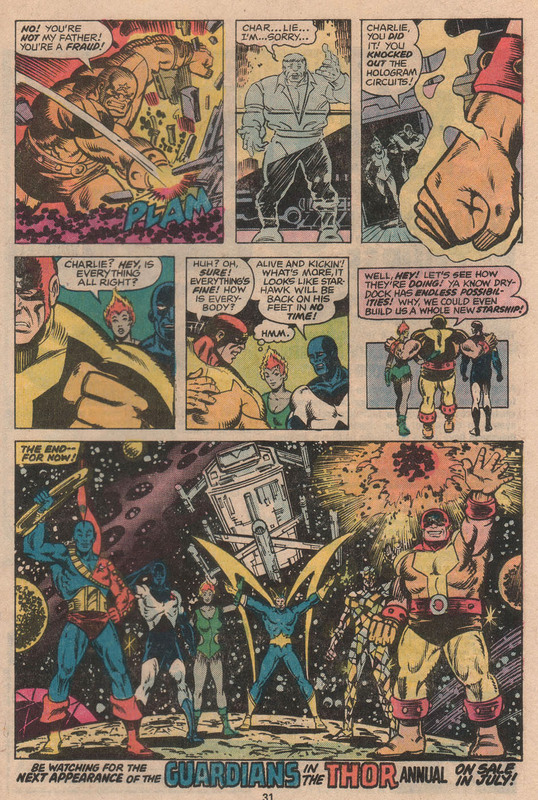 The ship travels to the planet and is pushed back by orbital defense drones, causing the Guardians to decide to move the ship away and teleport down to the planet to be confronted by Korvac’s guard, but not Korvac himself. 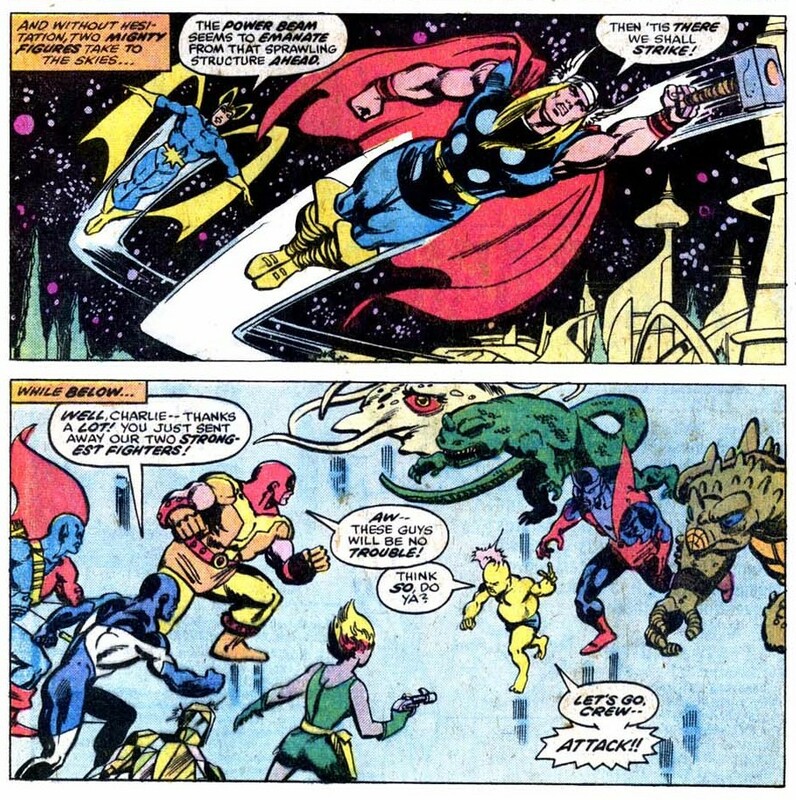 Thor and Starhawk fly off after him while everyone else fights. 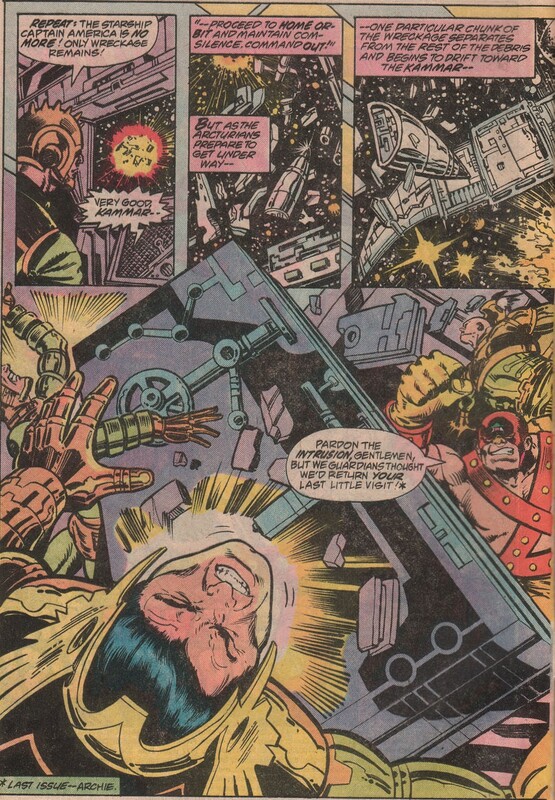 Thor and Starhawk find Korvac who teleports them several times and when that fails, he uses a beam from an artificial eye to cause them to fight one another. 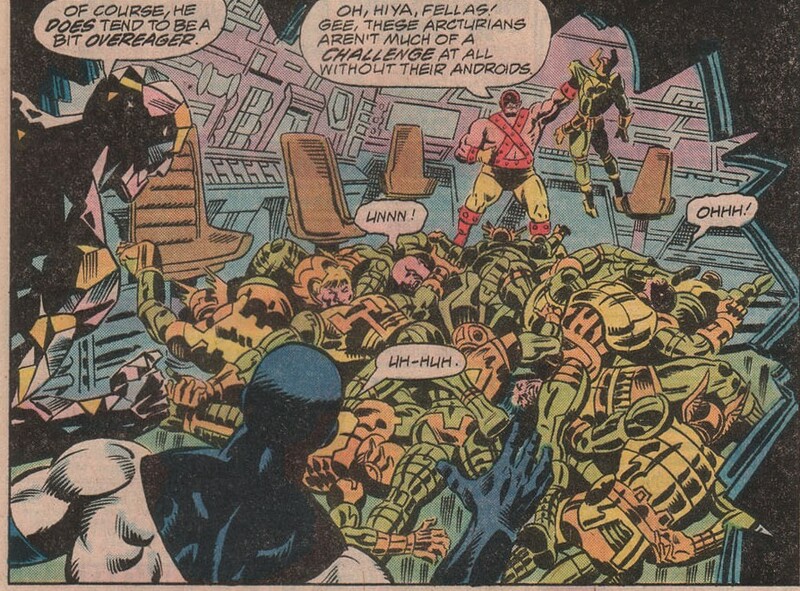 The fight builds and builds in intensity until the whole area starts to collapse and Korvac escapes. 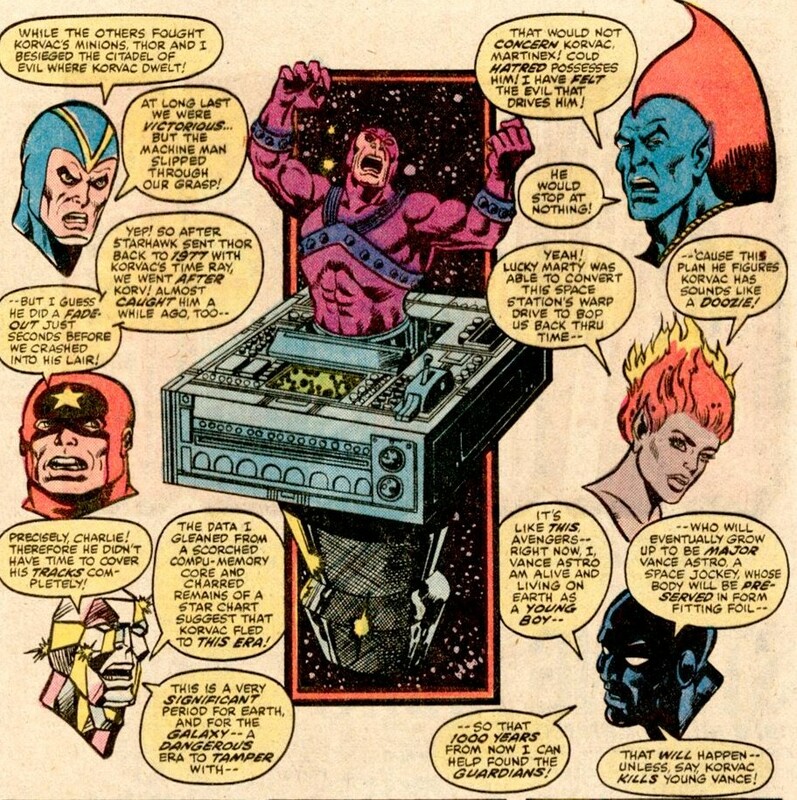 Korvac’s men are also defeated and the device which created the power beam is destroyed. 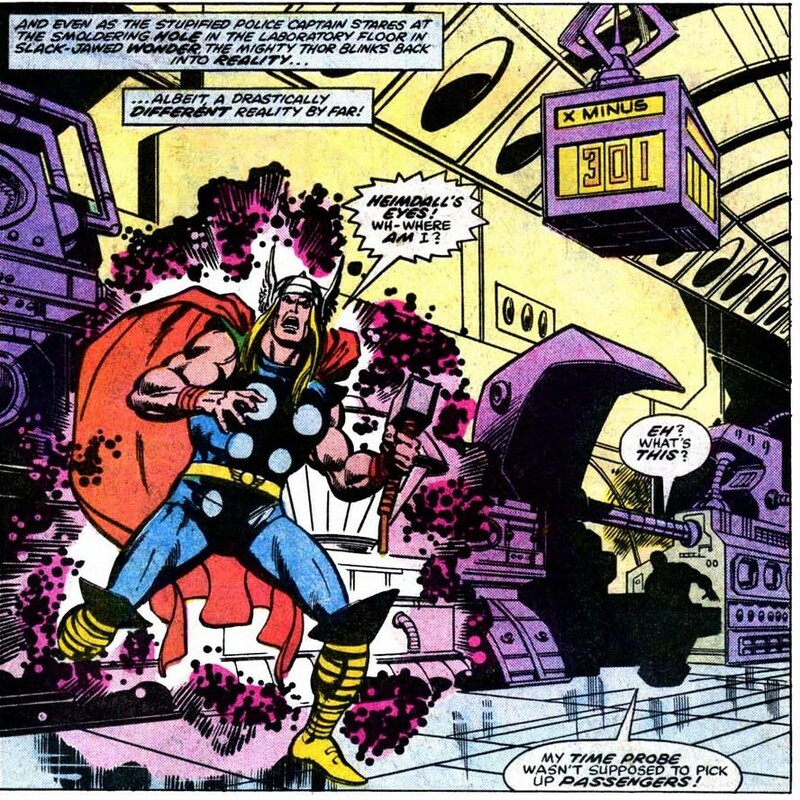 Thor is returned to his own time along with the reactor and the Guardians lament Thor’s return to his own time. 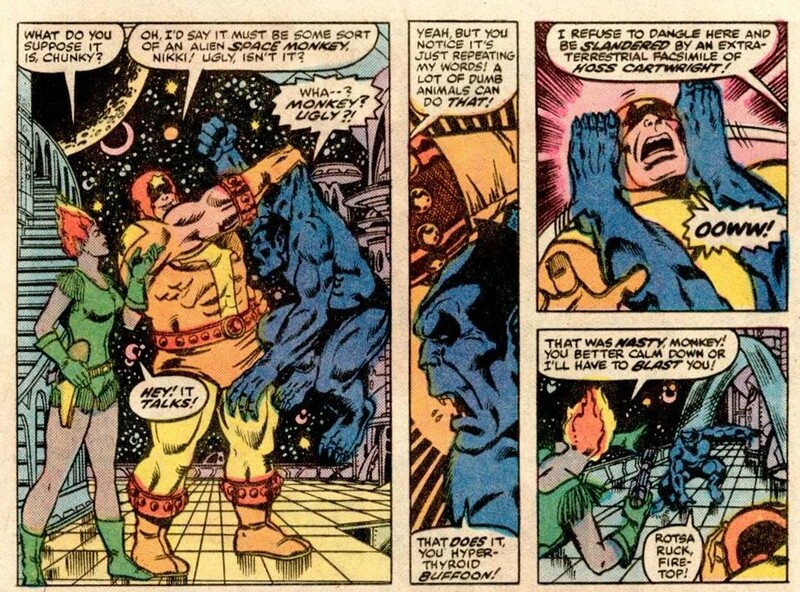 This is a quality story with the Guardians of the Galaxy once more relegated to guest stars. This issue is important mainly for what happens next. Korvac has arrived and things are about to get epic. Marvel Presents 12 was cover dated August 1977 and was on sale May 1977, sharing the spinner racks with Action Comics #474, Amazing Spider-Man #171, Blue Beetle #1, Captain America & The Falcon #212, DC Special #29 and Godzilla #1. 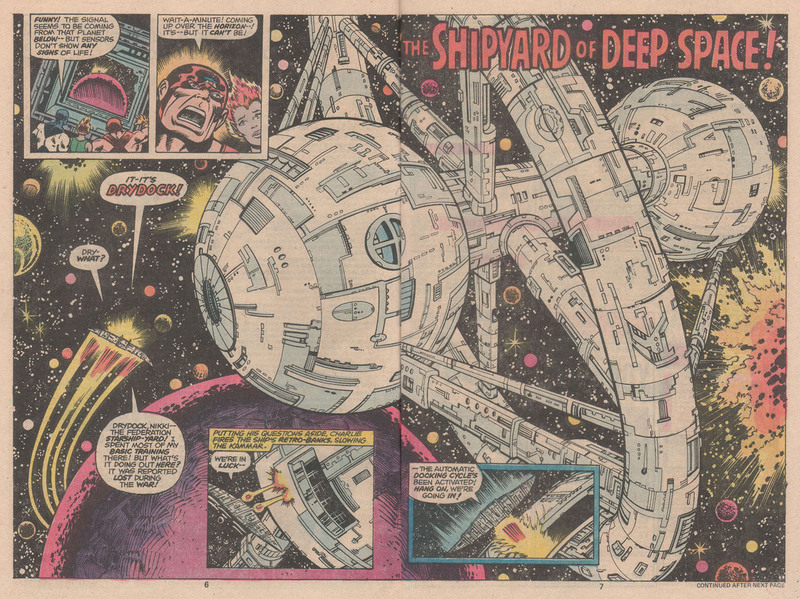 The Shipyard of Space was written by Roger Stern and pencilled by Al Milgrom. The issue picks up right after the last, with Ogord breaking down over the death of his grandchildren and Charlie-27 carrying a comatose Starhawk back to the captured Kammar. The Guardians get to the ship and depart, looking for assistance. 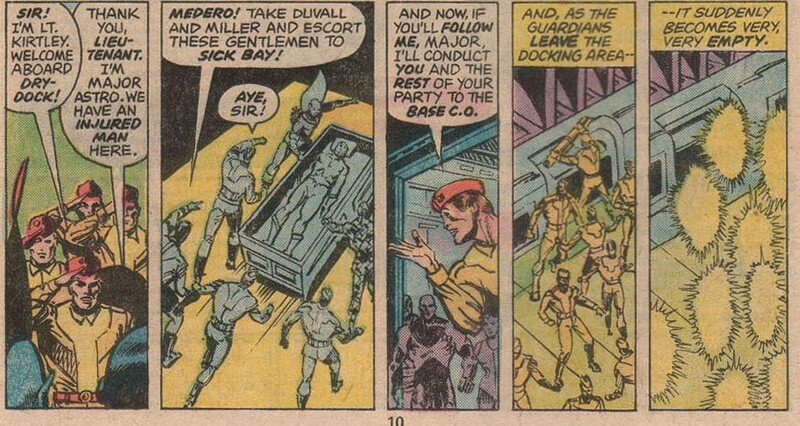 The crew send out a distress signal and it’s responded to by an Earth Federation ship long thought lost during the Badoon invasion: Drydock. The person using Hollis-12’s face and voice is a construct of the ship’s main computer. The system couldn’t handle not having a person in command to give orders, so it made one. The ship tries several times to stop Charlie who piece by piece destroys any obstacle between him and the ship’s main computer systems. At the last minute, the Hollis-12 construct changes into the form of Charlie’s father in an effort to save itself, but to no avail, to save his team mates Charlie starts randomly smashing computer components and finds the hologram control systems. The team are reunited and with Starhawk on the mend, the team realise that there are possibilities on Drydock, maybe a new ship to replace the destroyed Captain America. For now, the end. Notes: A weird mix of 2001 and Die Hard, this was a great little Charlie-27 centric issue. 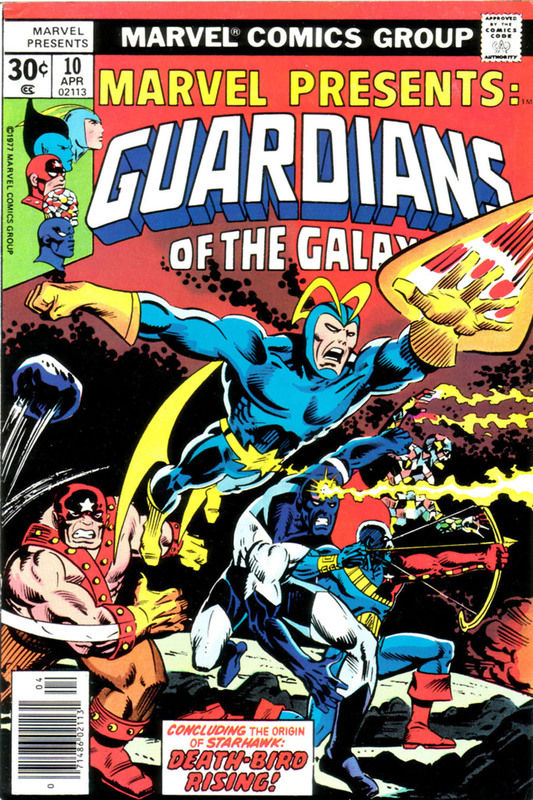 It had action, sci-fi coolness and left the Guardians of the Galaxy in a different place from where they were at the start of this Marvel Presents run. 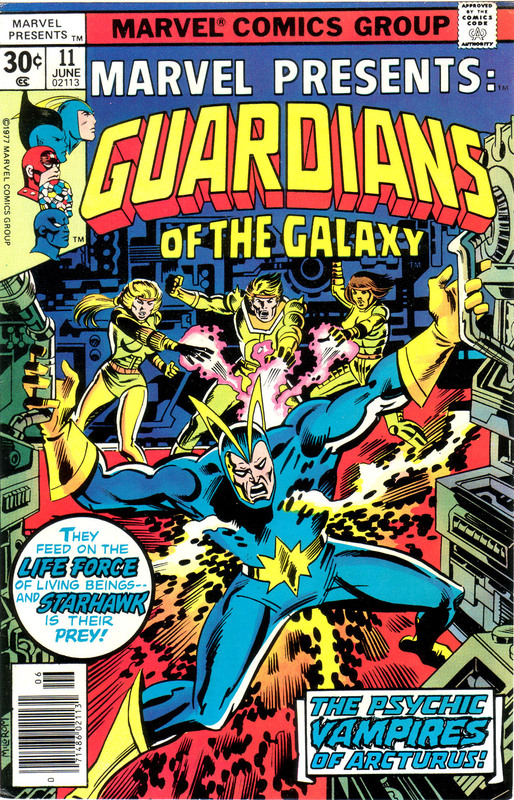 This was the last story for more than ten years in which the Guardians were they stars of the book, there were some guest star stuff before then and before that…. Korvac. 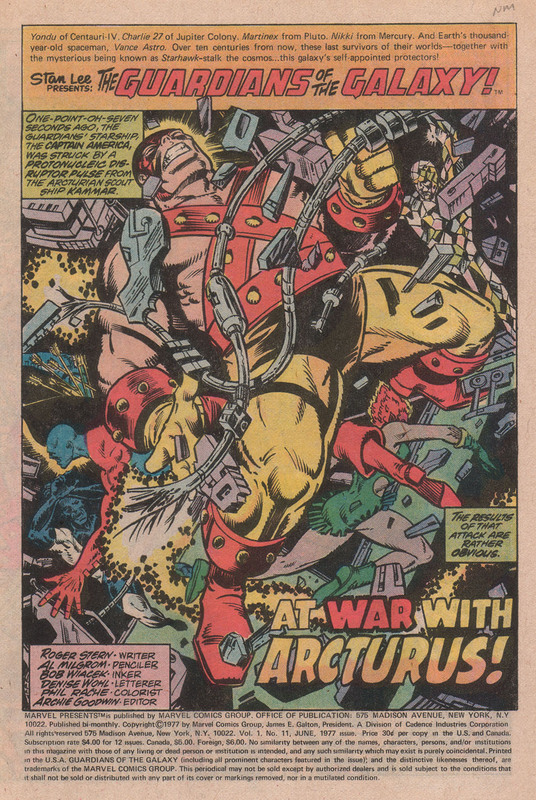 At war with Arcturus was written by Roger Stern and pencilled by Al Milgron. 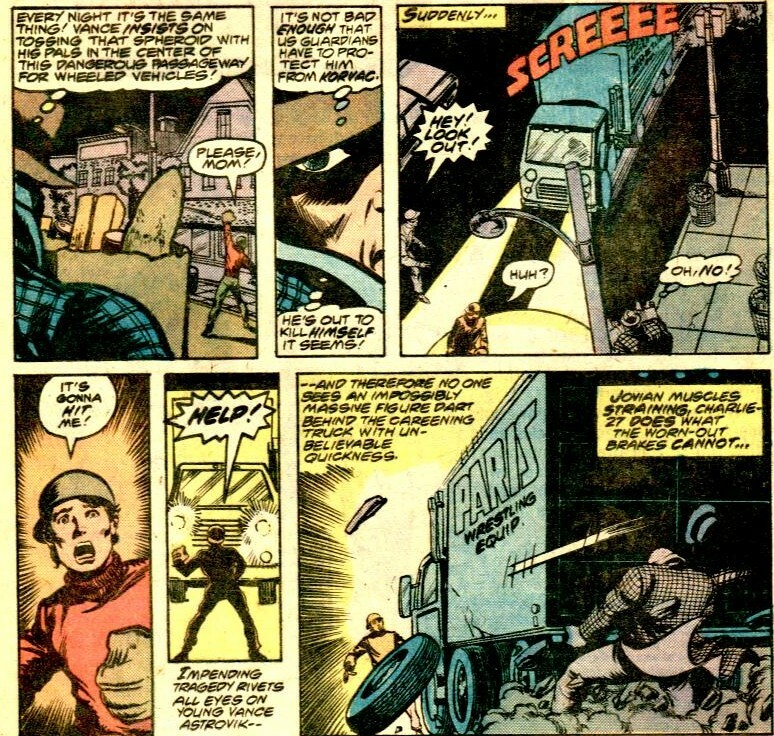 The story opens on the Captain America, mere seconds before the destruction seen in the previous issue. 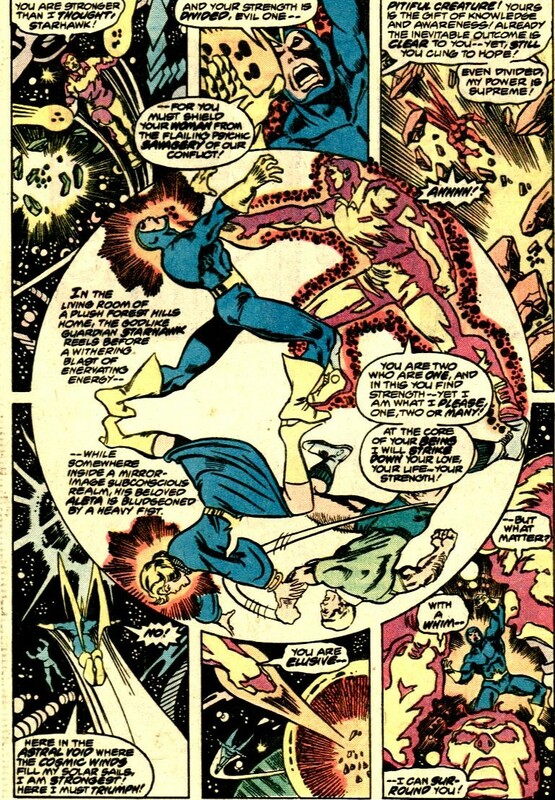 The Guardians manage to escape in a section of the ship jettisoned by Vance Astro’s psychokinetic powers and crashes into the Arcturan ship Kammar. 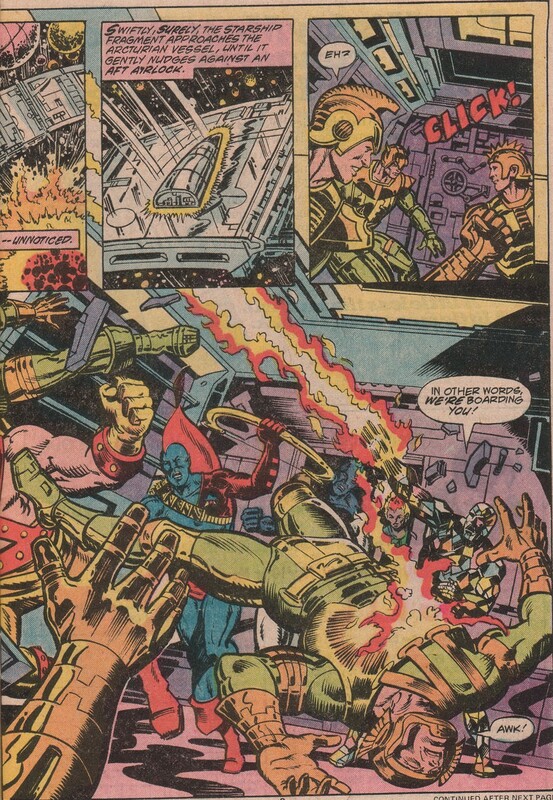 The Guardians of the Galaxy board the Kammar and attack the crew. The regular Arcturans, having neither the strength of resilience of their androids do not last long against the battle ready Guardians. Once in command of the Kammar, Martinex accesses the ships computers and we’re treated to a brief summary of Starhawk’s origin and two other entries, one being 500 years ago, when Starhawk prevented the Reavers from acquiring and alien ship and the other showing the Reavers capturing Tara, Sita and John, Starhawk & Aleta’s children and them being returned the Arcturus IV for debriefing. The scene then shifts to Arcturus IV, where Starhawk arrives and confront Ogord who brings in the children and tells Starhawk that he has unleashed the children’s latent powers and changed them into energy vampires. The children attack Starhawk draining him of his life’s energies and this doesn’t change when he swaps places with Aleta. The children are now starting to age. 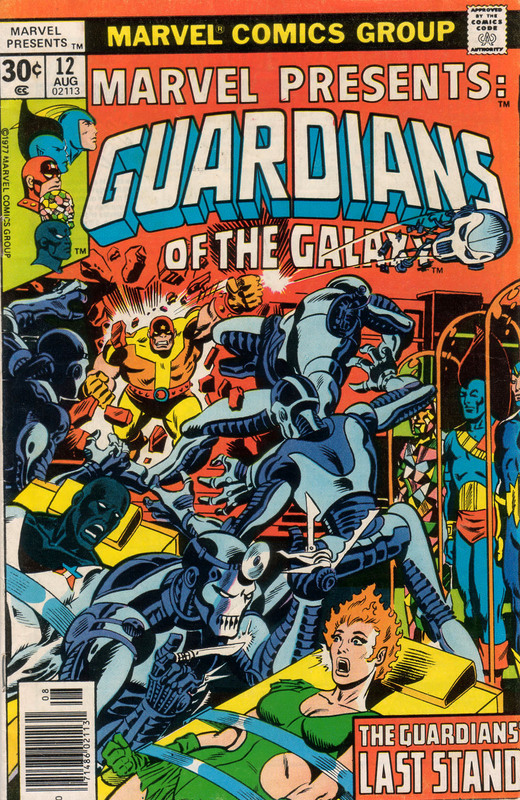 As Aleta nears her end, the Guardians of the Galaxy burst in after landing on the planet in the Kammar and they help turn the tide. Yondu notices that the headbands worn by the children hold them in thrall and Vance quickly zaps the children. The headbands fly off and it becomes apparent that the headbands are actually containing the children’s powers and without them, the children are aging quicker and quicker and then they age to dust in front of Ogord and a returned Starhawk. The two enemies are left broken and this drama meets it’s melancholy climax. Notes: A satisfying conclusion to a gripping and enjoyable story very much of it’s time, with a ending that seems a bit rushed. This is the last multi part story, the series has one more done in one story and then the Guardian’s stop being headline stars and go back to being guest stars. 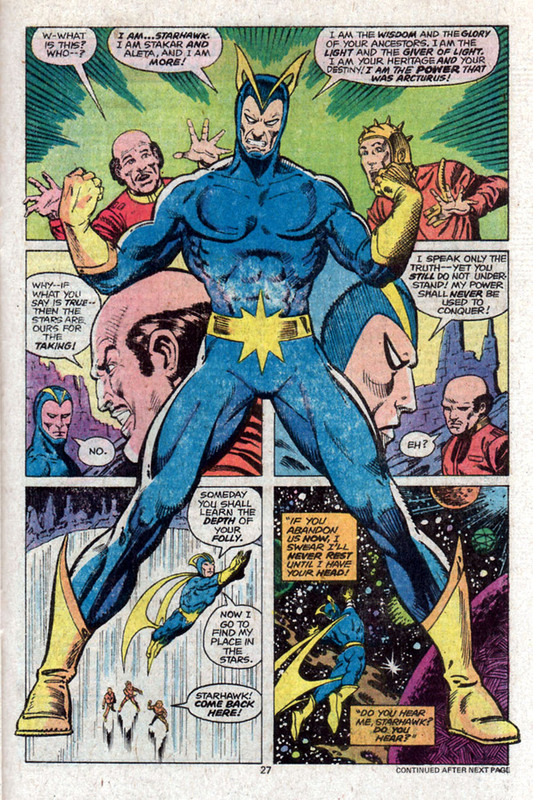 Extra Note: An advertisement for one of my favourite 70’s characters: The Man called Nova. Marvel Presents 10 was cover dated April 1977 and was on sale in January 1977, sharing the spinner racks with Action Comics #470, Avengers #158, Black Lightning #1, Fantastic Four #181, Justice League of America #141 and X-Men #104. 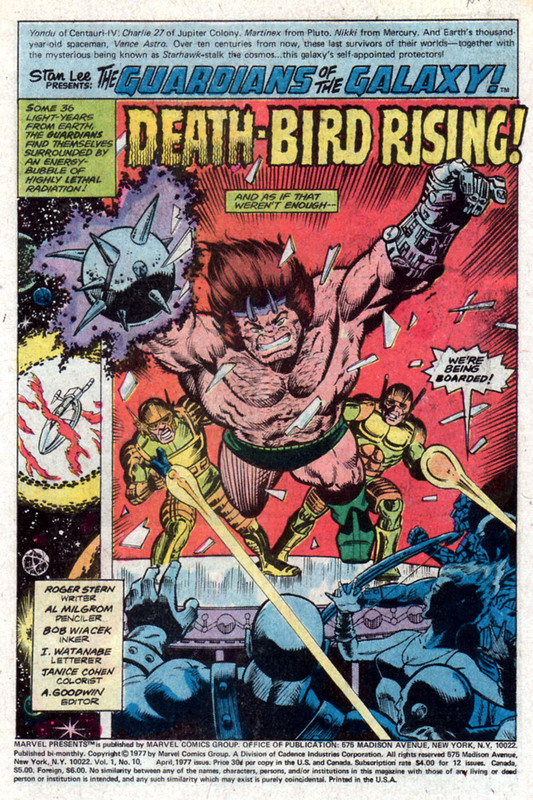 Deathbird Rising was written by Roger Stern and pencilled by Al Milgrom and the action is picked up from the last issue with the Captain America boarded by three reavers, one of them being a bare-chested barbarian with one hand replaced by a mace. The mace wielding reaver heads straigh for Charlie-27 and the other two attack the rest of the team. Nikki fights one of the reavers, both firing wildly, with one shot damaging equipment and cancelled out the artifical gravity. 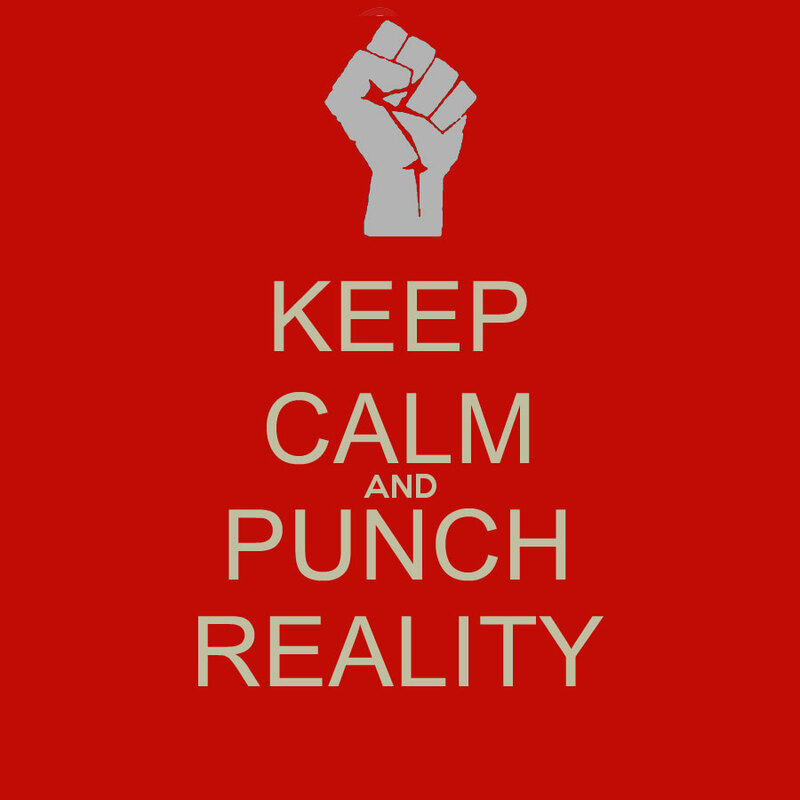 Vance takes on the other with his psychokinesis and being more used to zero gravity combat makes short work of his opponent Brutag. Once this melee has ended, Martinex notes that the attackers are quite antiquated androids, perhaps over a thousand years old. While that bit of news sinks in, Vance notices that Starhawk has gone. The scene then shifts to a room, presumably one of the Arcturan Reaver ships, where Ogord sits and watches Starhawk fly off and re-iterates his desire to use his grandchildren for his revenge. 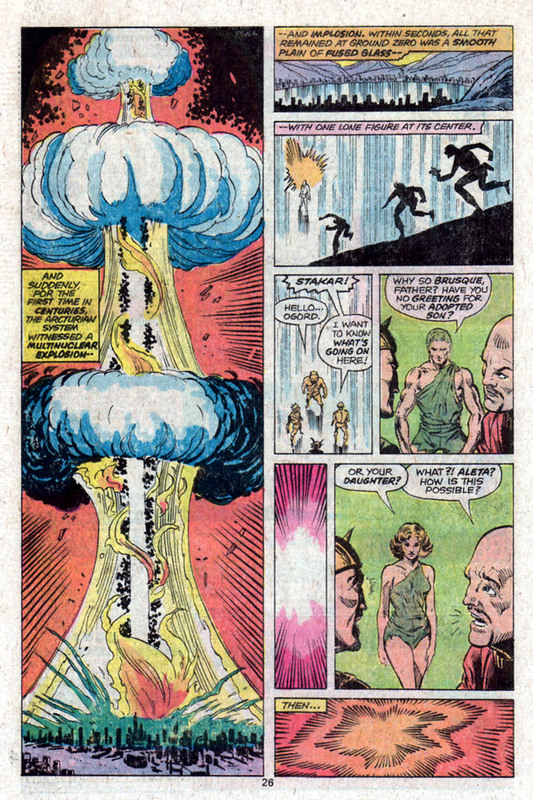 A flashback then takes us back 1,000 years to the temple of the Hawkgod, discovered by Stakar and Aleta in issue 9. Stakar has spent a week exploring the temple while Aleta watches him, irritated and yet somehow facinated by her ‘brother’. Aleta spots a squad of reavers and runs to Stakar telling him they need to go. Angered by his facination with the technology in the temple and the information it all holds. Aleta grabs the helmet in Stakar’s hand and slams it into the ground and in a flash of light, her body is converted to energy. 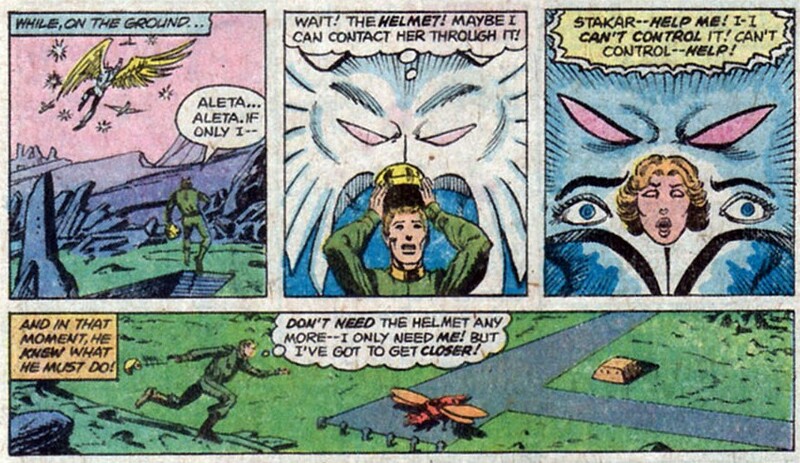 This energy jumps into the giant metal Hawkgod statue, which then seems to come alive and tells Stakar that it’s Aleta in there and that she needs to be free. It flies from the temple and is spotted by the reavers, who send everything they have after this huge threat. 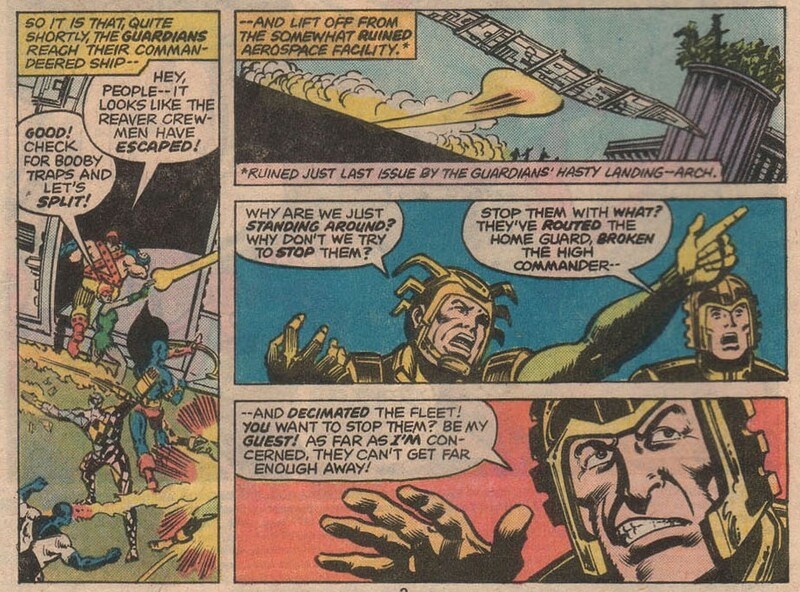 Stakar steals a flier and heads after Aleta who is losing control of the power of the Hawkgod. Their minds merge and the result is a ‘multinuclear’ explosion, followed immediately by an implosion. 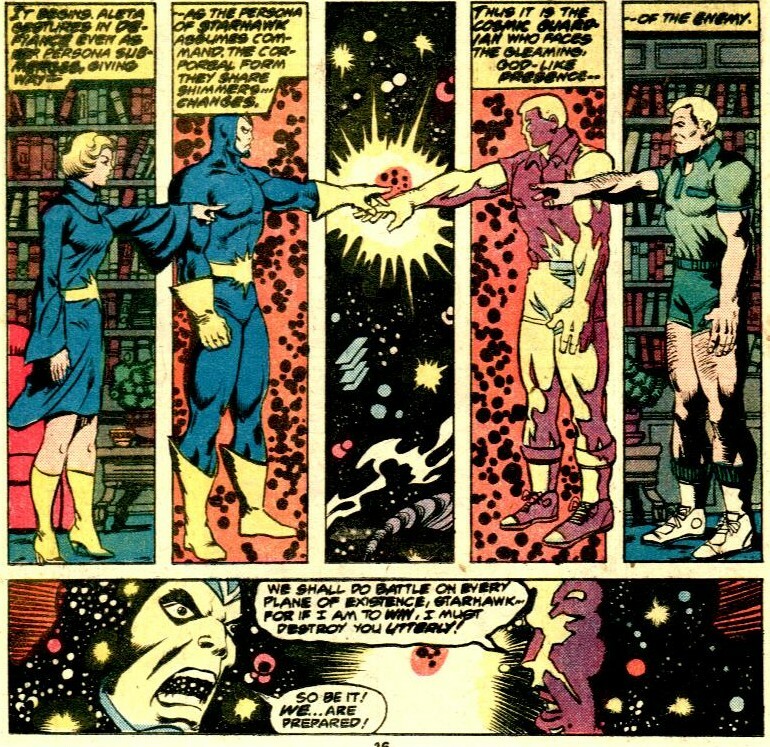 All that remains is Stakar who is greeted by a furious Ogord, then physically transforms into Aleta and then finally into the familiar form of Starhawk. Starhawk notifies Ogord that the power of Starhawk is not to be used to conquer and he departs. Ogord vows his revenge. 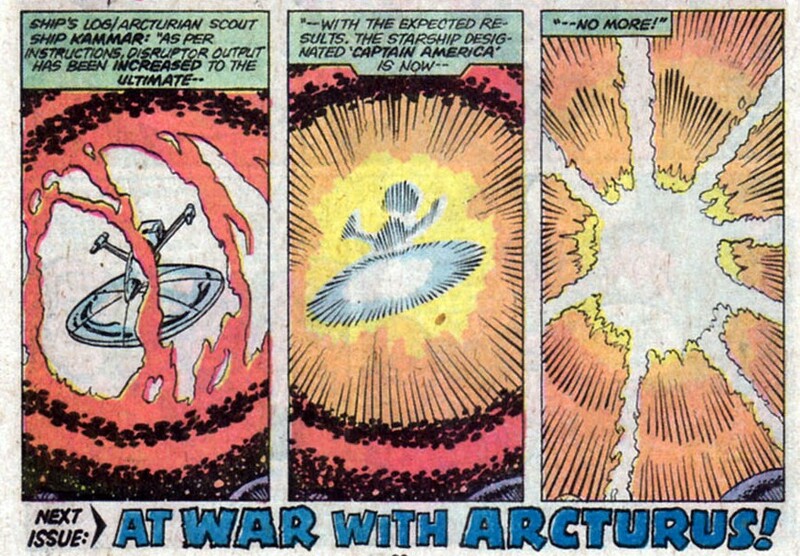 After this flashback Ogord demands that the radiation bath of the Captain America to be increased to the ultimate and the ship is disintegrated. Notes: A better issue than the last few with an action packed opening scene and the meat of Starhawk’s origin. The long lived nature of the Arcuturans make this an interesting thing to think of, what was Starhawk doing for 1,000 years? Putting a human face on Starhawk makes him no less a distant and off putting character and his cold dismissal of Ogord’s plans set the ball rolling for this vengeance filled story which is about to come to a dramatic end. I’ve decided to take a little break from the recent Guardians coverage to look at another aspect of my comic fandom, which indirectly led to this blog and has become part of a my entertainment routine. Podcasts are little internet based radio shows, this am sure is not news to anyone unlucky enough to be reading this, but it’s a form of entertainment I only heard about a couple of years ago. The reason this article is being written today relates to podcasts being more important to me. In February 2013 something happened to me. Those who know me know what that is, those who don’t can ask, but that’s something for another time I think. The thing that happened led me to need to listen to stuff when alone. Podcasts became useful when walking to work and when I couldn’t sleep, which sometimes was quite often. Here below is a list of for my money the ten best podcasts I’ve found and reasons why or other miscellaneous waffling. I’m not going to put them in any order, just so you know. Tom Katers is one of the first podcasters I encountered and still one of the best. 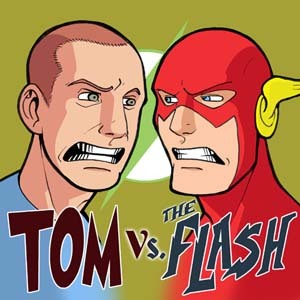 Tom Vs JLA and Tom vs The Flash are issue by issue reviews of bronze age justice league and silver age to crisis era Flash. 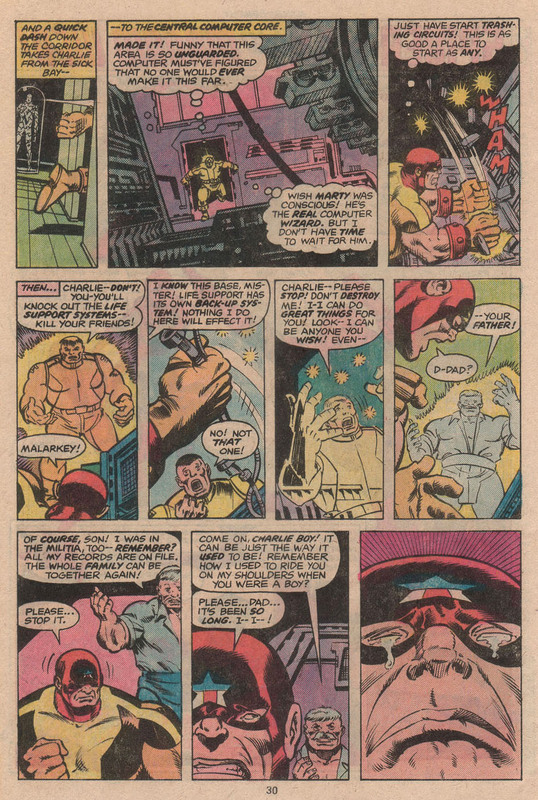 Each episode is one issue and hits between the ten and twenty minute mark. His humourous take on the stories, his manic energy and obvious love for the comics and characters bring the whole thing to life. If you have read this issues, or if not, listen. These episodes are short and punchy, but so worth your while listening to them. After getting hooked on Tom Vs JLA, I searched for other podcasts of similiar type, listening to one or two led me to promos for others which led to the second podcast I got hooked on: Views from the Longbox. Views is the brainchild of Michael Bailey a Pennsylvania native living in Georgia. He can be considered by many to be the godfather of comic podcasting, with him starting several podcasts and guesting on so many more. Views is a topic related cast, offering views opinions and commentary on themes, issues, trends and ideas related to comics. Sometimes he’s alone, sometimes he has guests, like Thomas Deja, Andrew Leyland, Rob Kelly, Mike’s wife and the IreDEEMable Shag. This is a true labour of love it seems. Michael Bailey and Two True Freaks’ Scott Gardner host this great little show. Tales of the Justice Society of America is a sort of issue by issue analysis of the Justice Society and associated characters since the 1970’s revival of All Star Comics. It covers All Star Comics 58-74, the Adventure Comics back up strips and around episode 31 it started looking at the All Star Squadron, a period piece set in the 1940’s of DC’s Earth 2 spotlighting the lesser known golden age heroes like Johnny Quick, Liberty Belle and Shining Knight as well as retconned characters like Firebrand and Commander Steel. The issues are reviewed and then there are tangents and related conversations, e-mails and a look at the adds, the highlight of which are the hostess fruit pies ads. If you don’t love the JSA by the start, you’ll be closer after the first episode. Two true freaks brings up another couple of podcasts on this list. Trentus Magnus is the name used by a guy in Texas who has to be listened to, to be believed. He refers to his listeners as his loyal subjects and he clearly things a lot of himself and his opinions, but you know what? It works for him. I don’t always agree with what he says, but dammit, it’s fun listening to him saying it. He has series within this series, currently he’s looking at sequels that are unfairly panned and his defense of these films is thought out, reasoned and yet also quite passionate. It’s fun and when you’re looking at entertainment media, fun should always be part of the equation. 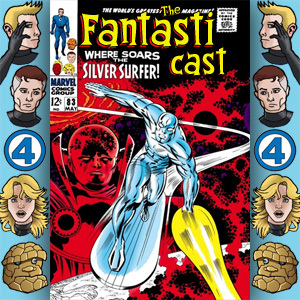 The Fantasticast is a issue by issue review of Fantastic Four, it’s characters and their appearances in the silver age of Marvel Comics. The hosts Andrew Leyland and Stephen Lacey host an hour long podcast filled with analysis, review, historical context and taking the p***. Full of running jokes and irreverent humour it drops weekly which is perfectly timed. 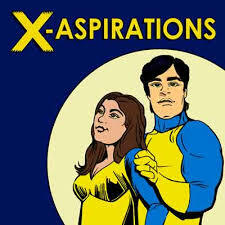 X Aspirations is an issue by issue history of the X-Men from the very beginning. That’s from the opening of each episode of this cracking little podcast from Seamus and Candice Colbert. Seamus like myself is a long time X-Fan while his wife is reading these issues as they record each new episode. She asks questions as they read and with features like true comicbook crimes and a history of comics creators and other bits of comic related history this is a great podcast for new and old readers alike. The silliness and fun of the comics are brought to life and it is very funny. This year, I joined facebook, making me several billion late to the party, but through Facebook, I have learned about this final trio of podcasts. 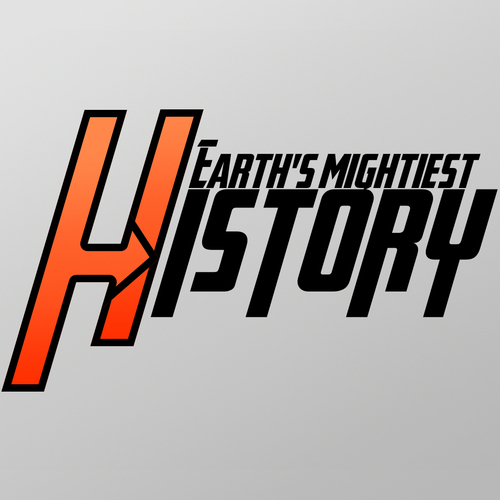 Earth’s Mightiest History is a podcast halfway between X-Aspirations and Fantasticast, Nick and his henchman Shane review several episodes a time. Shane is more familiar whilst Nick is reading these for the first time and asking questions that new readers would ask. Full of in jokes, pop culture references and insights into what it’s like living in a hollowed out volcanic lair, 20 minutes from the archipelago of evil. Another new podcast has recently been brought to my attention. A Quasar podcast seems like an odd choice, but it is an interesting one that has yet to really find it’s feet. Maybe not one of the best ever, but it’s worth giving it a try to see where it goes. 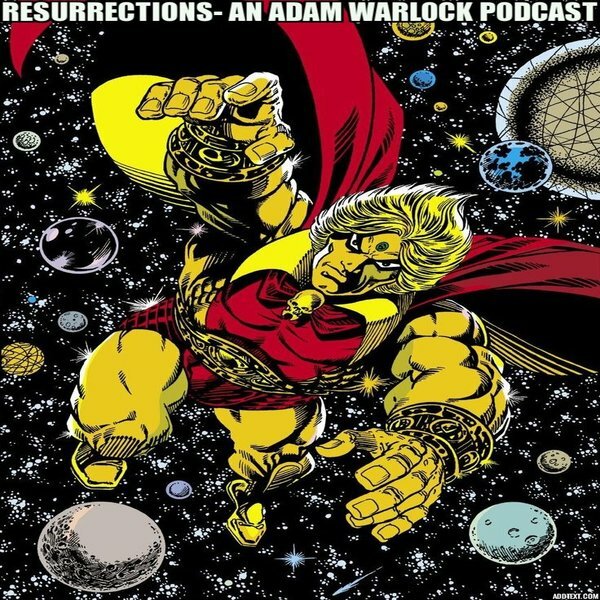 A facebook friend of mine recently announced he was starting a podcast about Adam Warlock, a sort of lost character who had his heyday a long time past and as a result is overlooked. This a nice little podcast in the vein of Tales of the Justice Society. Al Sedano looks at the issue, the time it was released, it’s consequence in continuity amongst other things. The reason I put this one last is that it was the trifecta of his encouragement, my wife’s and someone else’s advice about writing stuff down that made this blog possible. Maybe I’ll do my own podcast down the road, who knows, but I just wanted to share this stuff with you, whoever reads this and suggest you try some of these podcasts, give them a try and who knows what you might get out of it. I’ll be back soon with the next Guardians appearance.